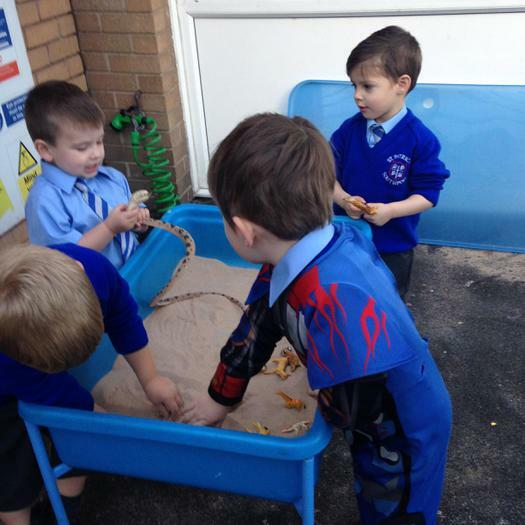 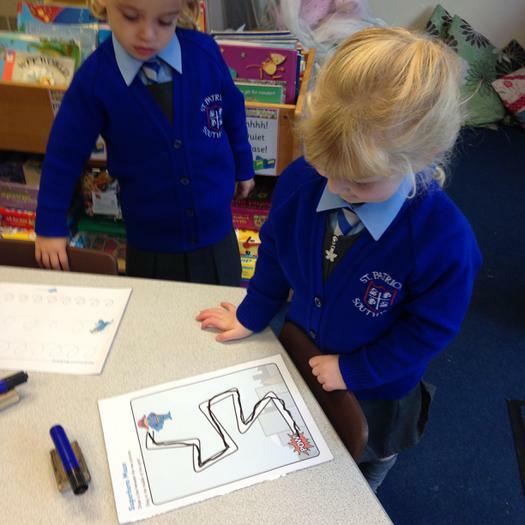 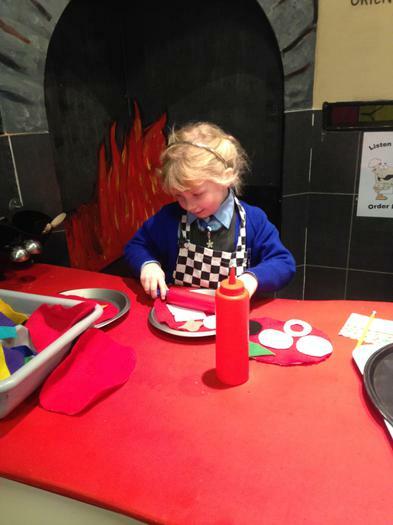 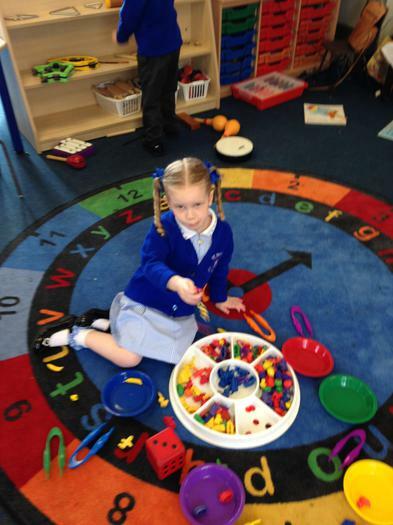 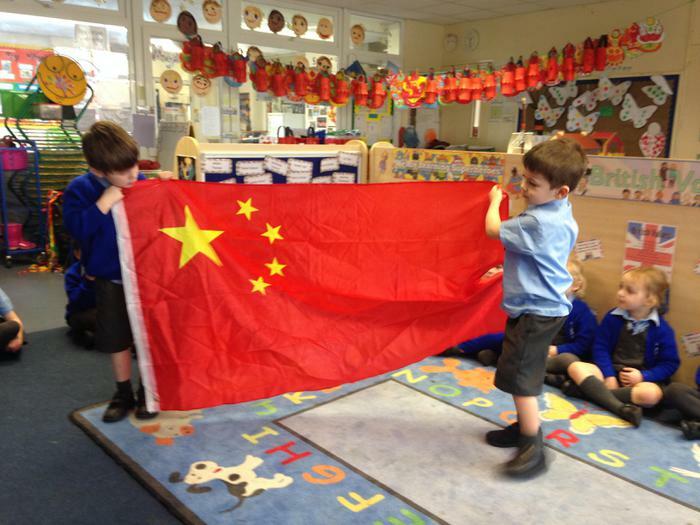 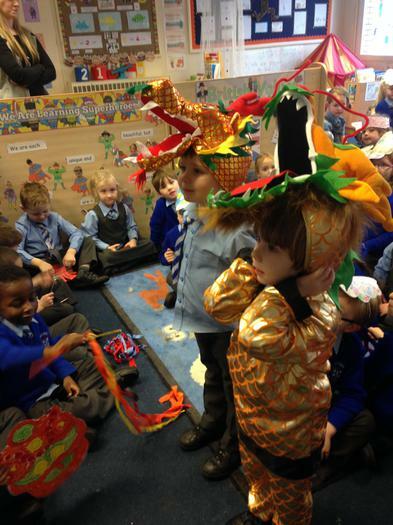 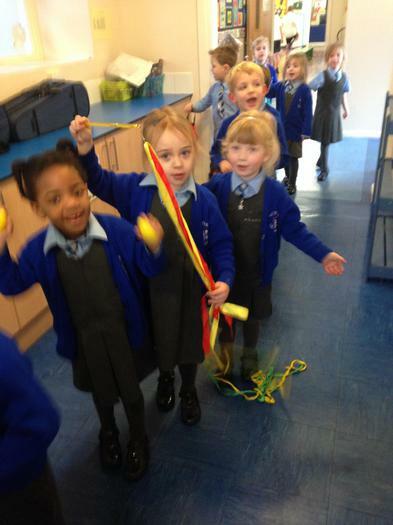 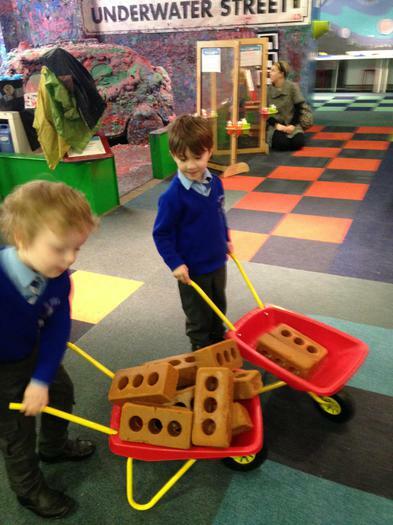 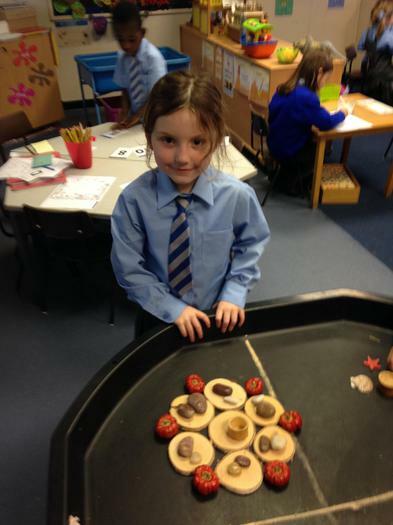 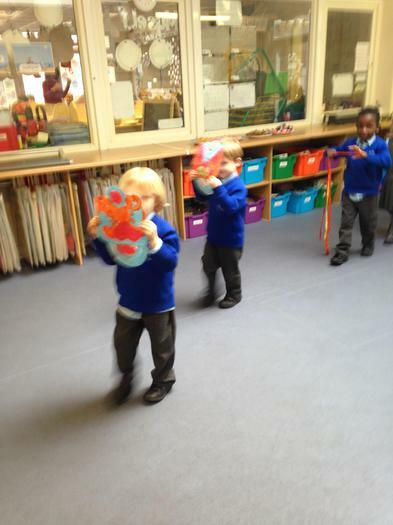 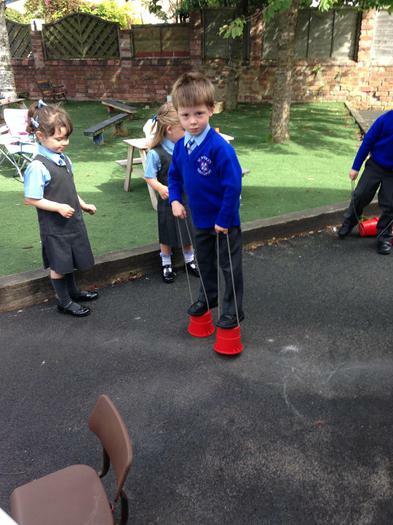 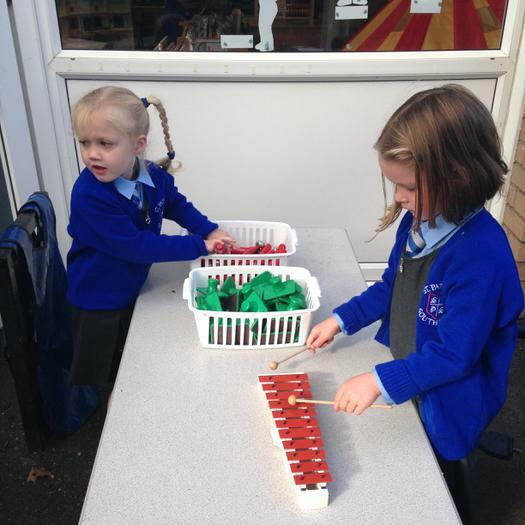 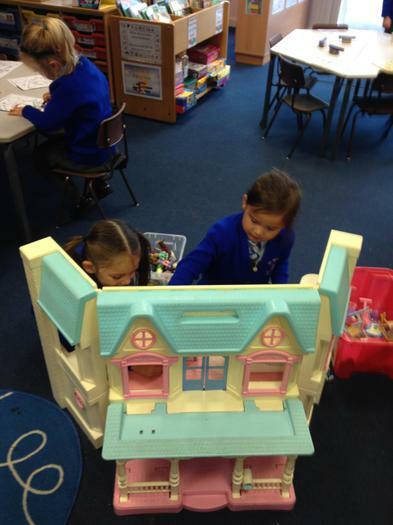 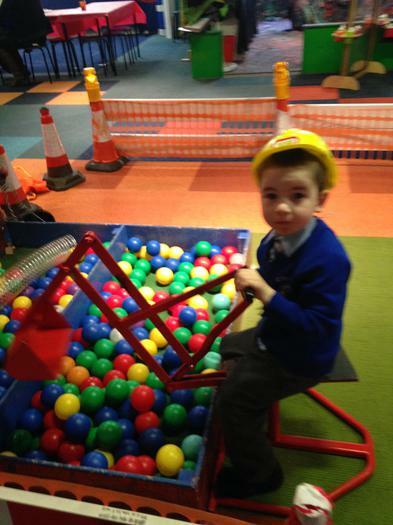 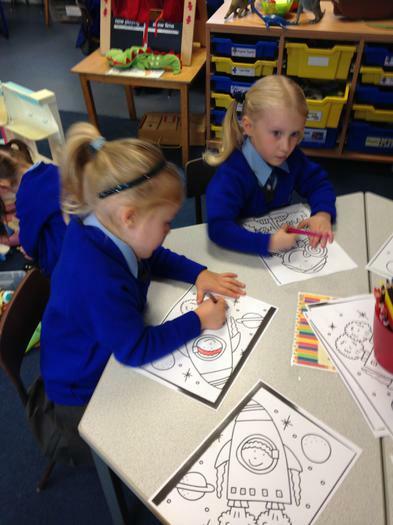 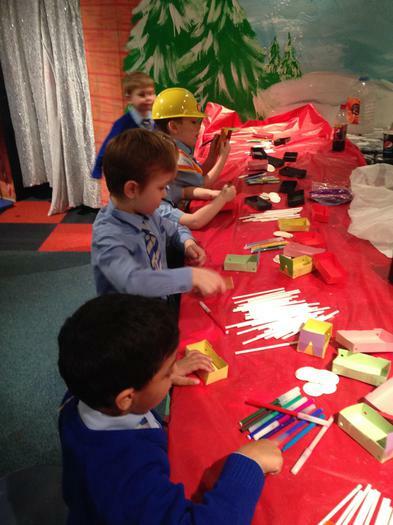 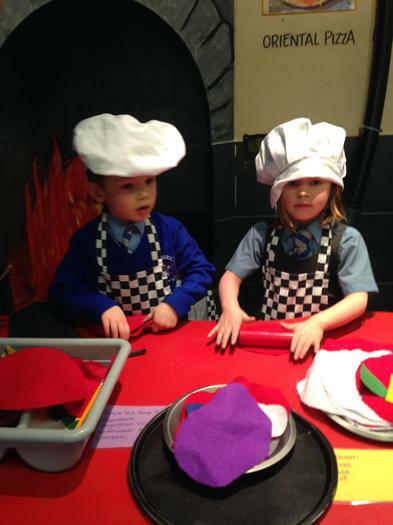 We have great fun in Reception and there are lots of different activities to help us with our learning. 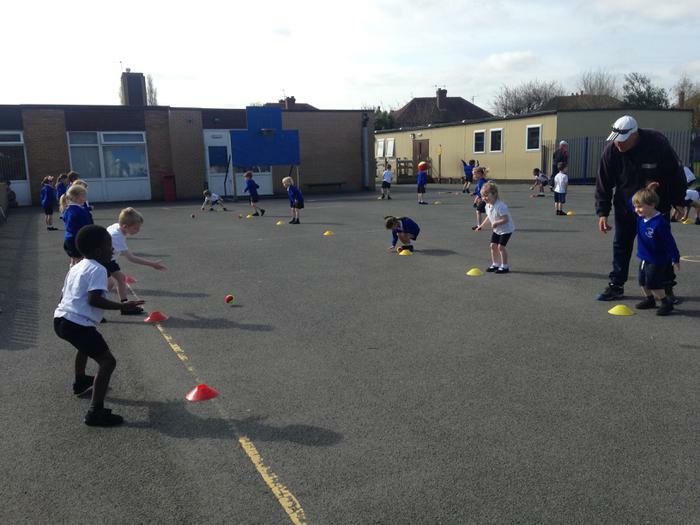 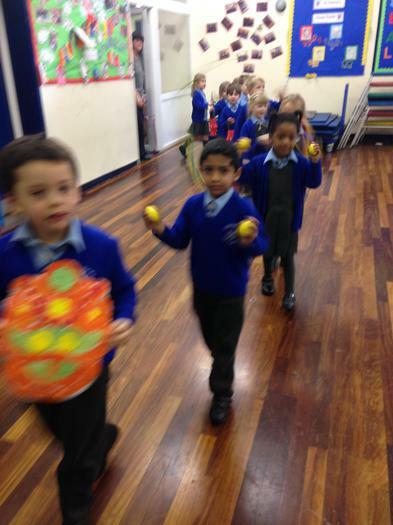 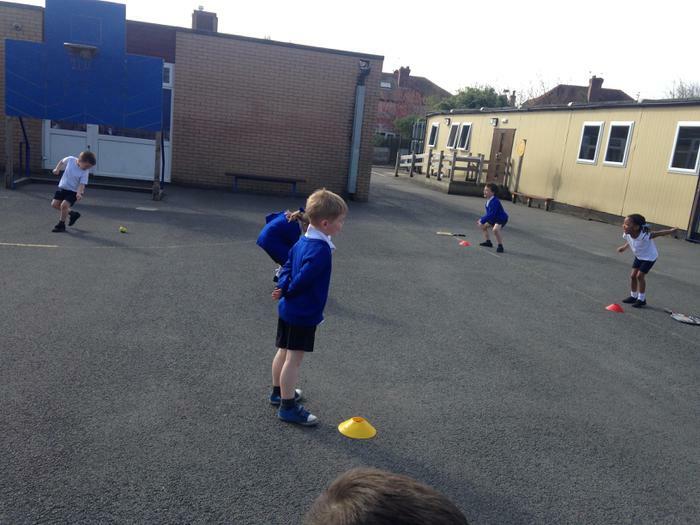 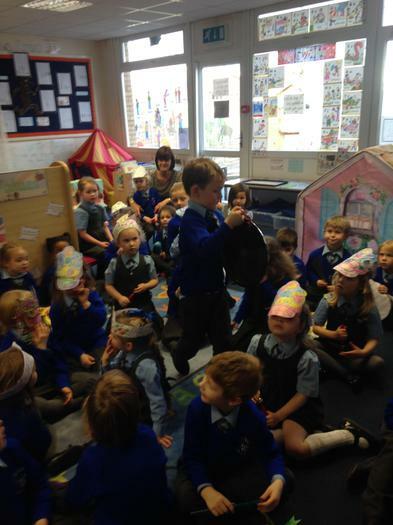 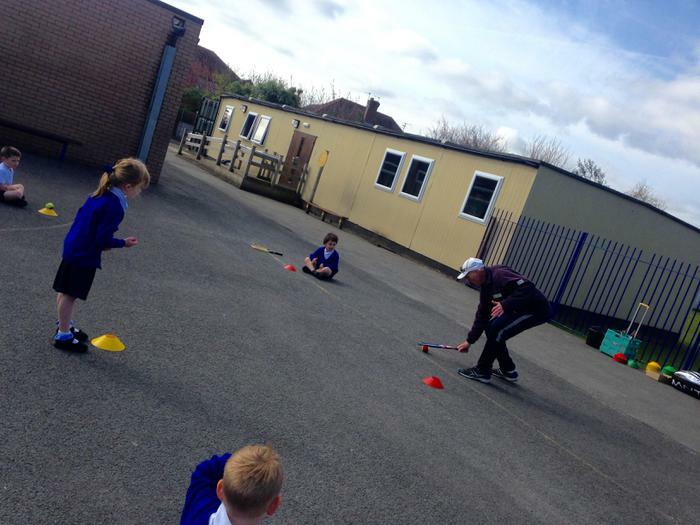 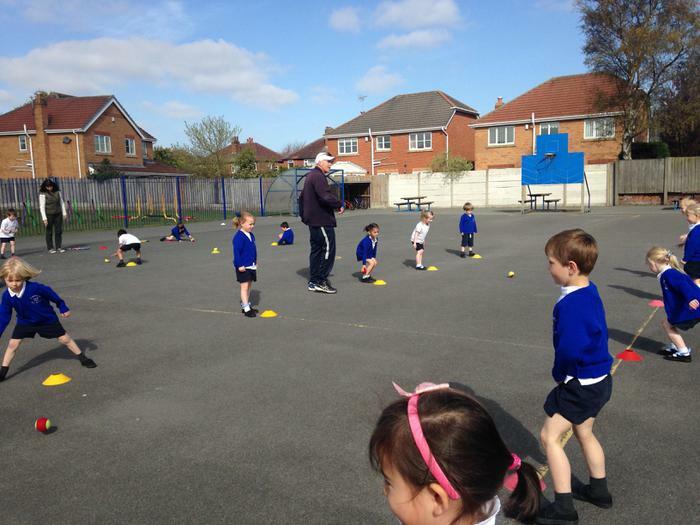 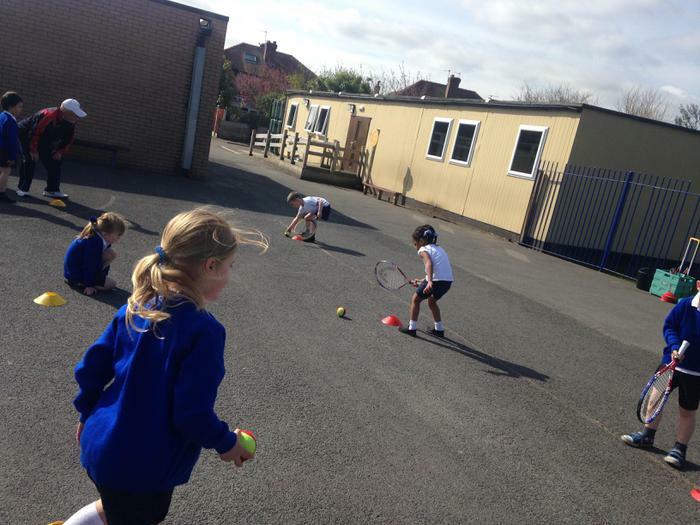 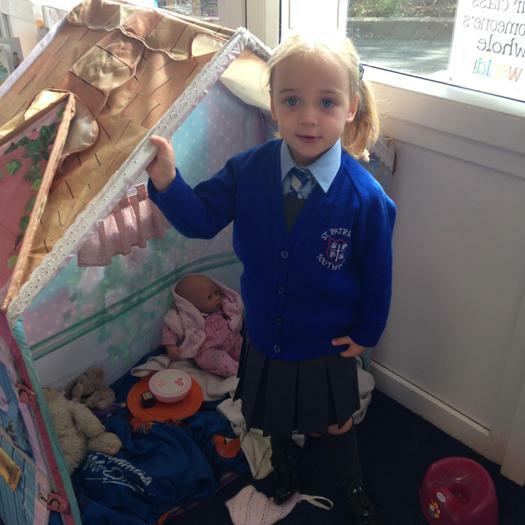 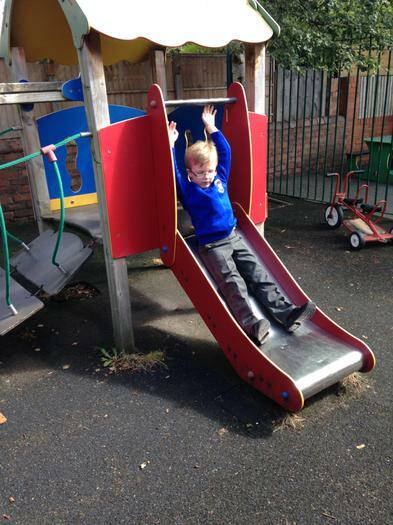 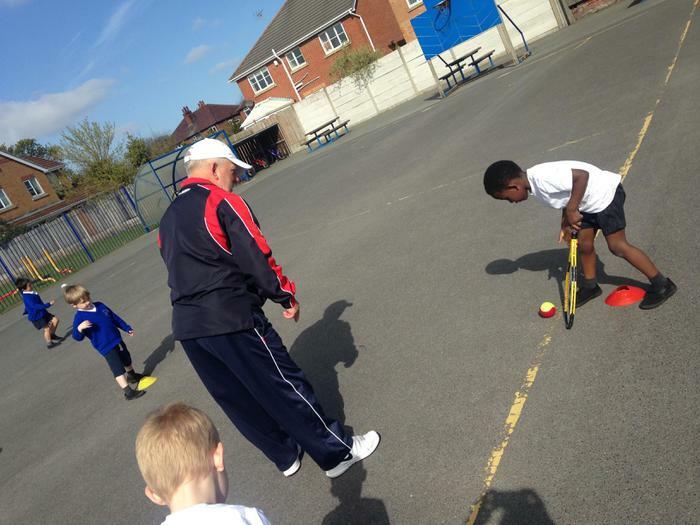 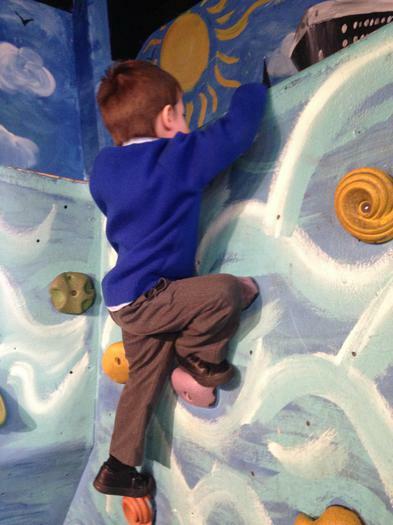 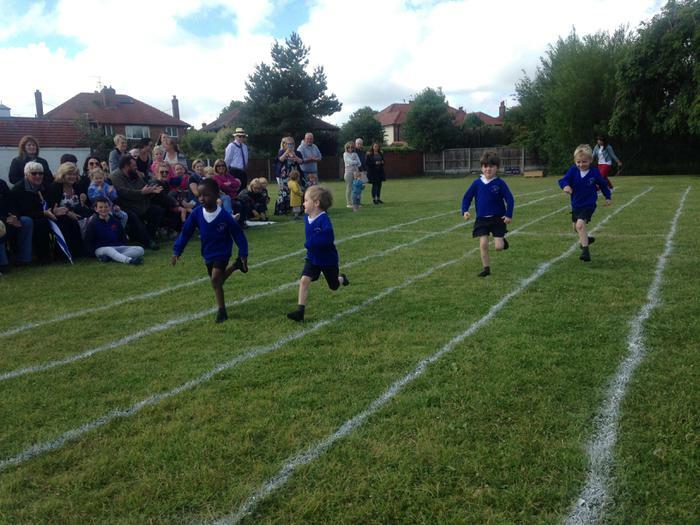 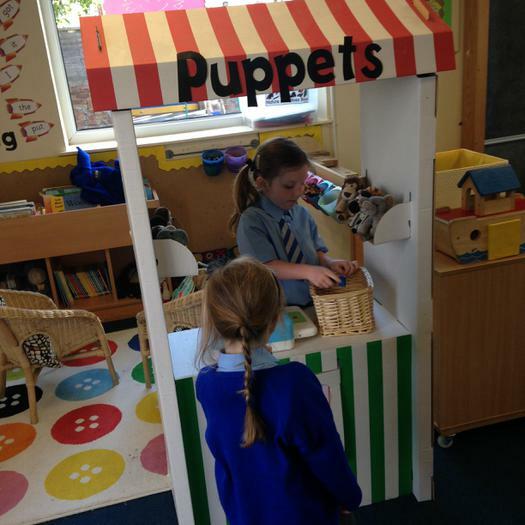 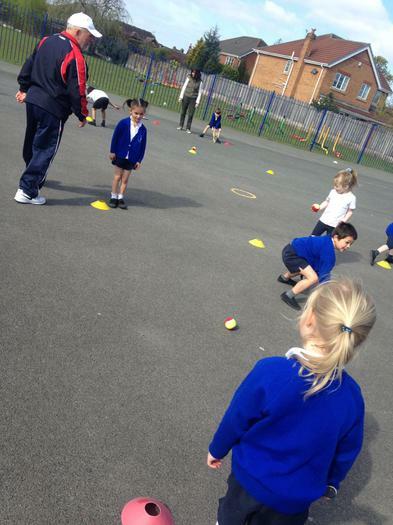 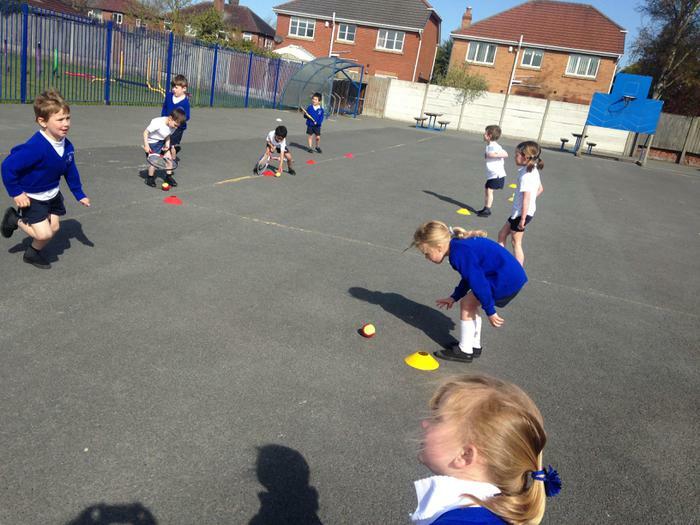 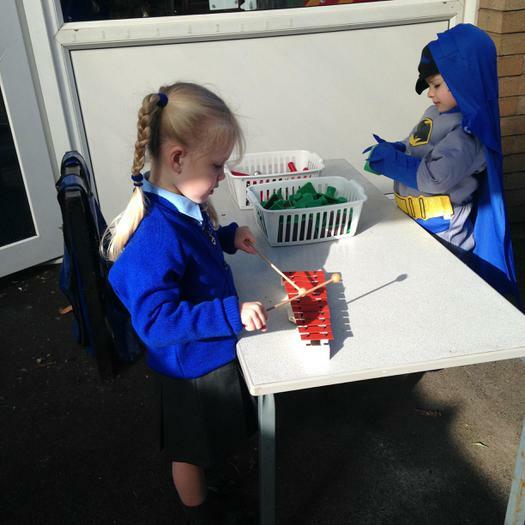 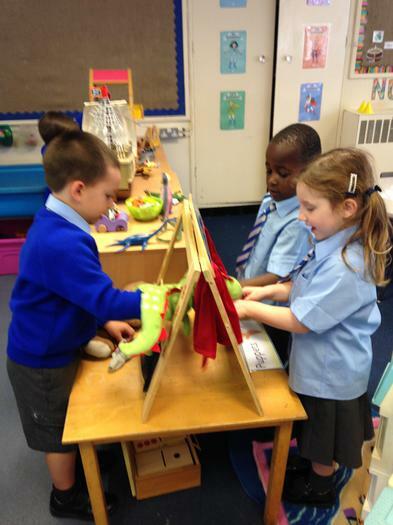 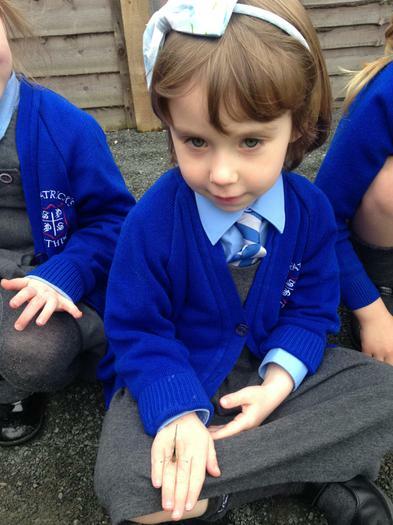 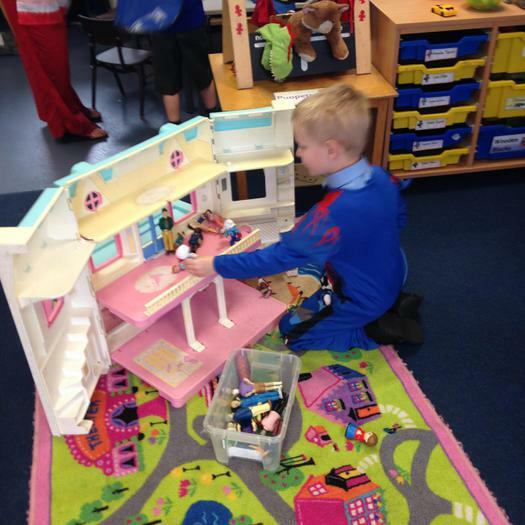 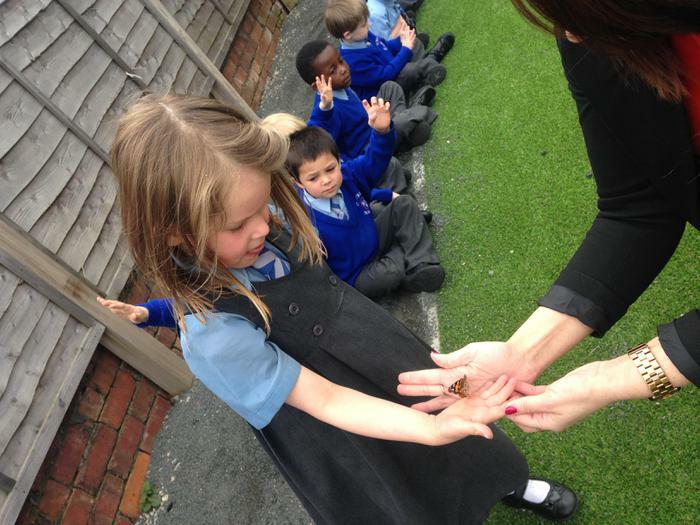 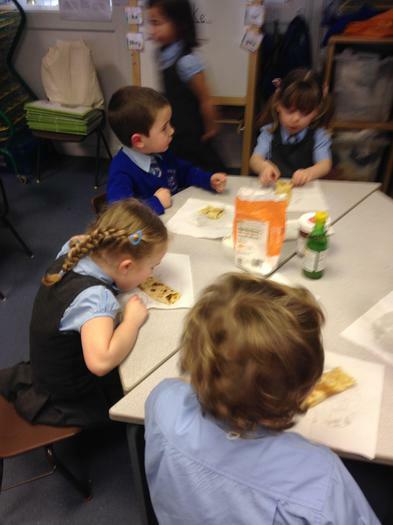 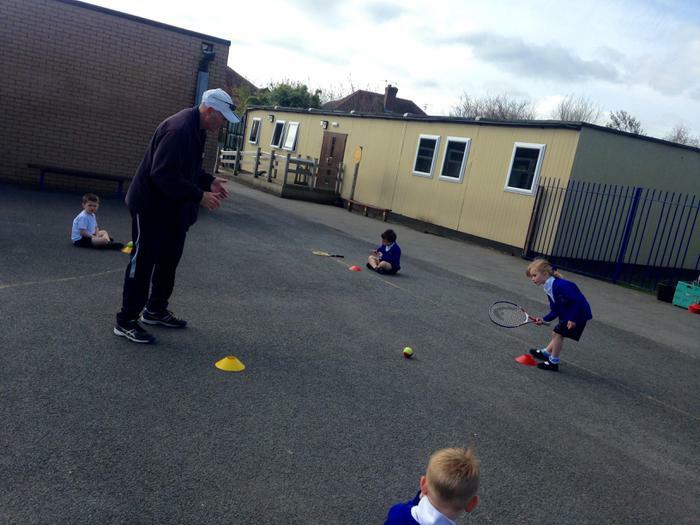 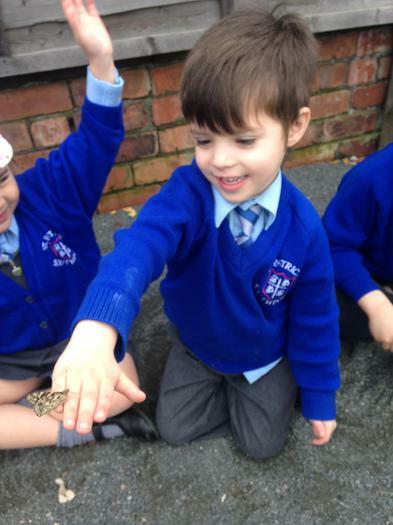 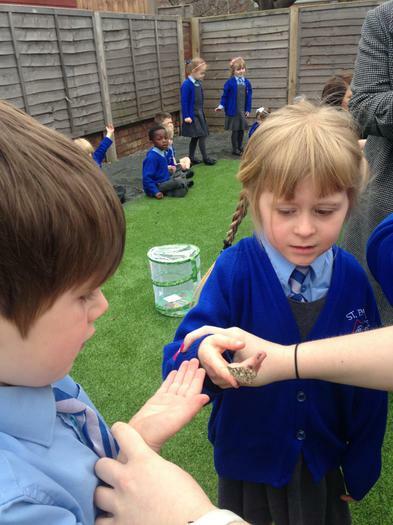 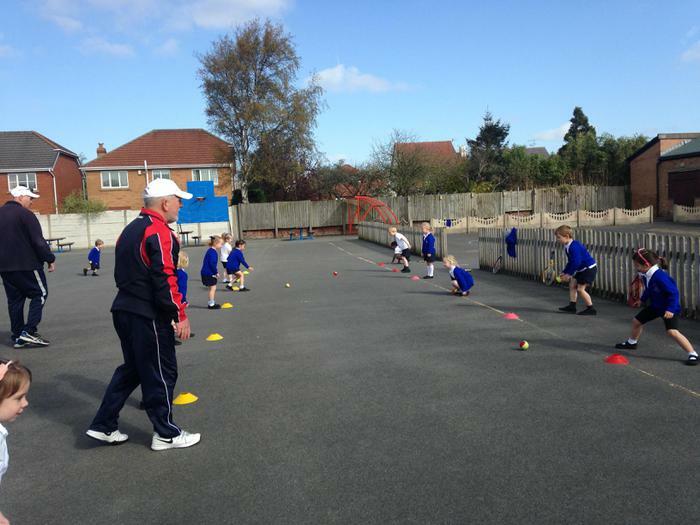 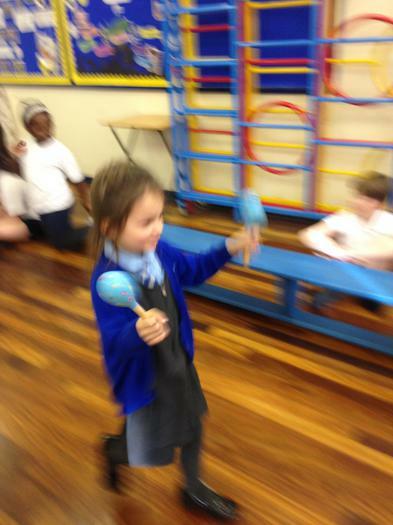 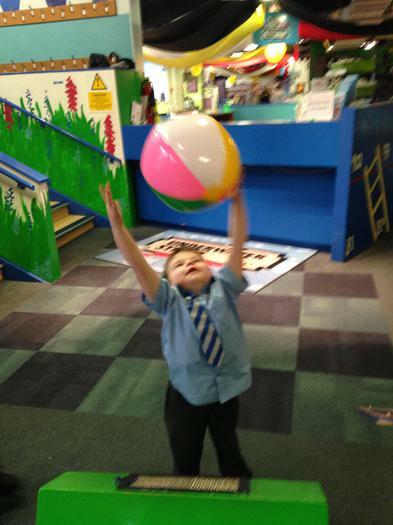 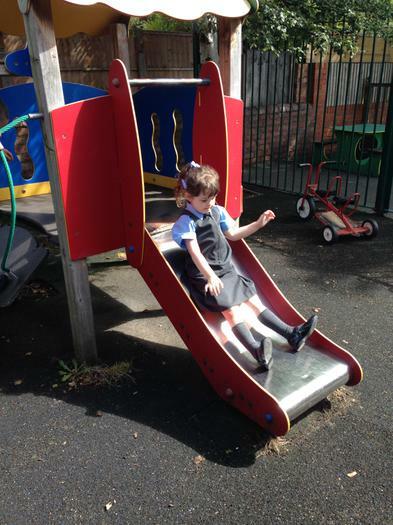 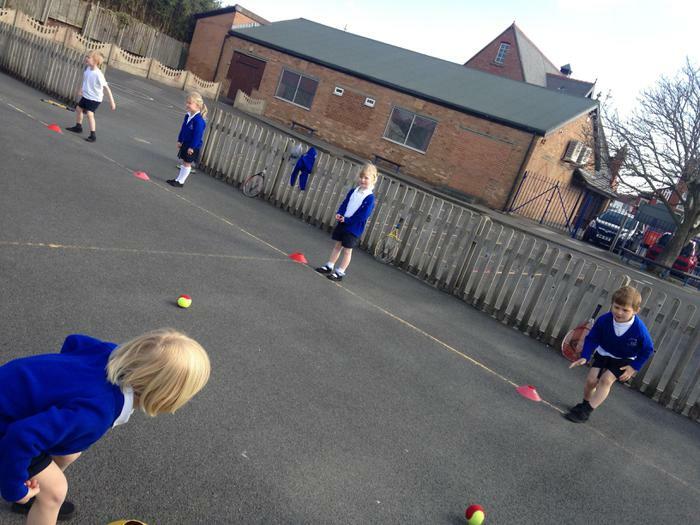 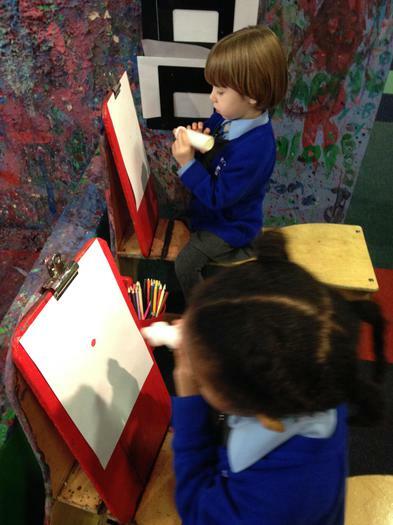 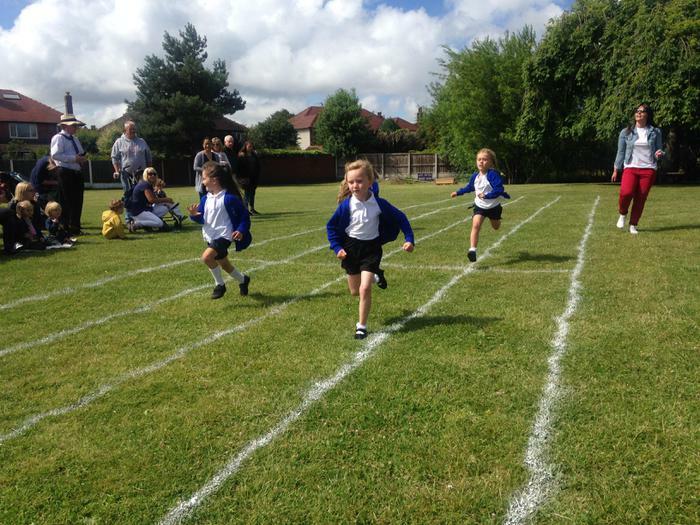 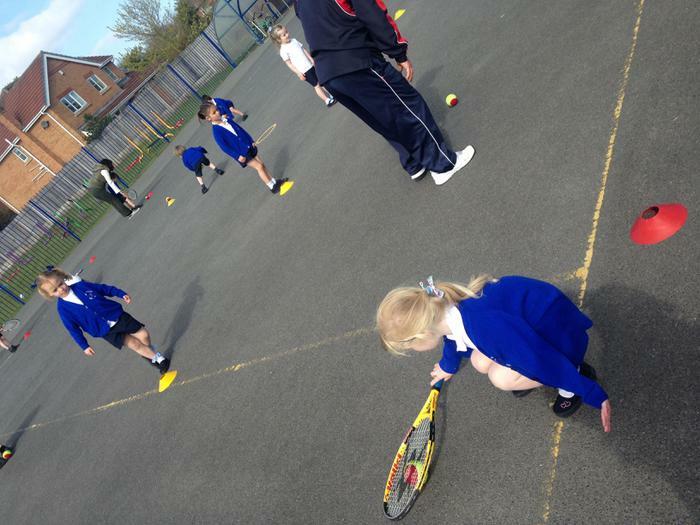 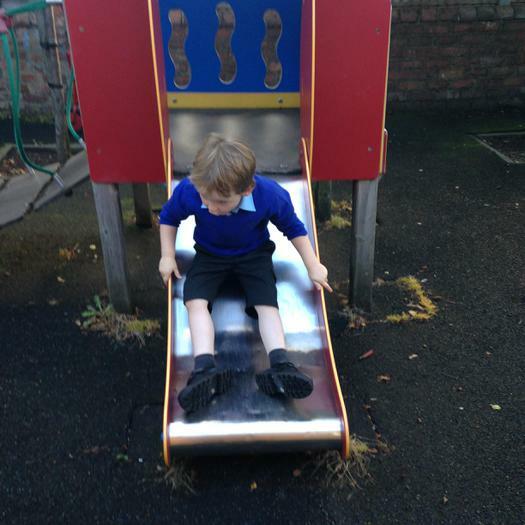 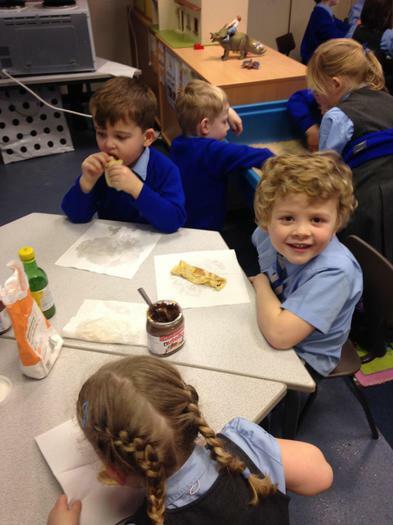 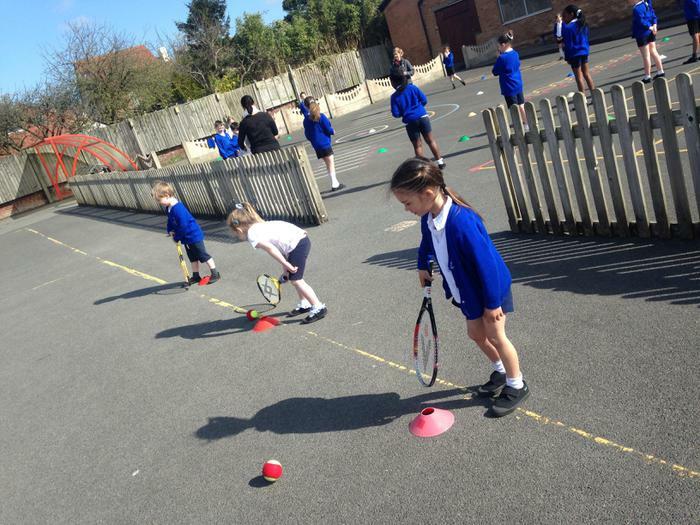 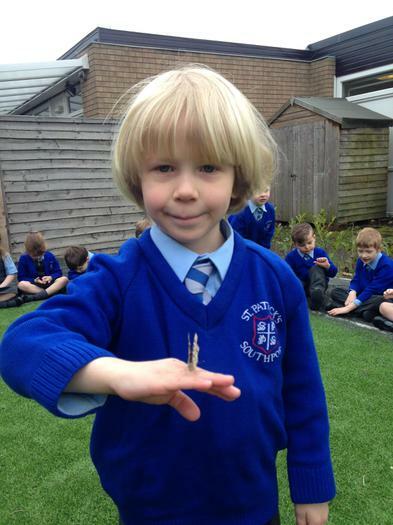 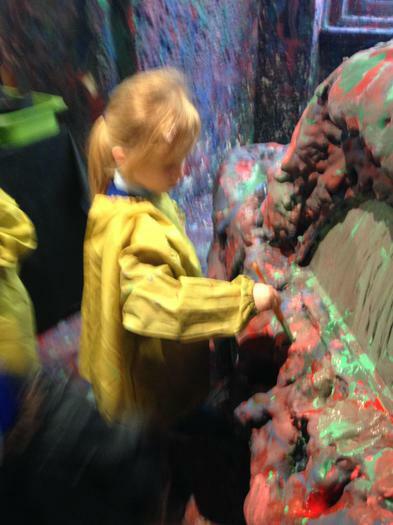 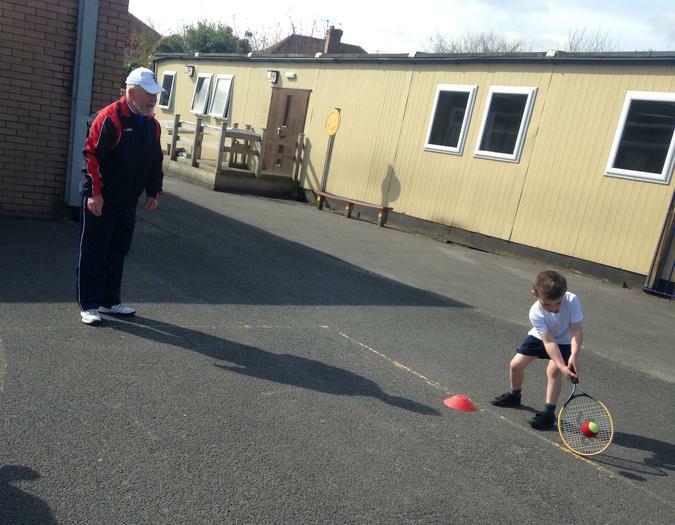 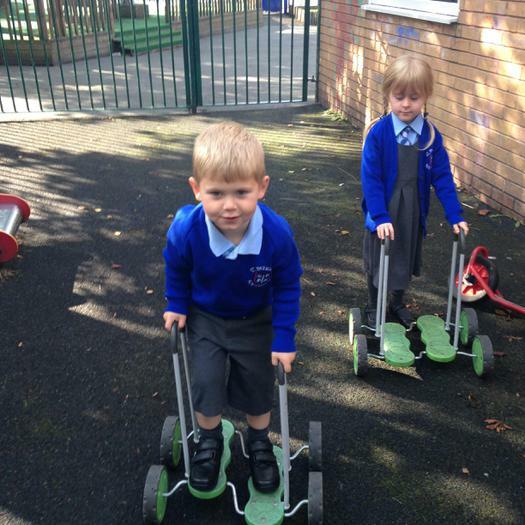 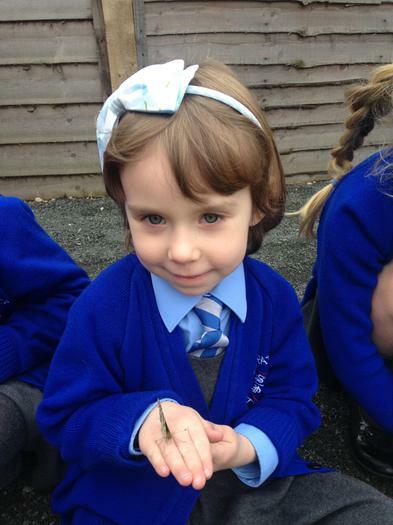 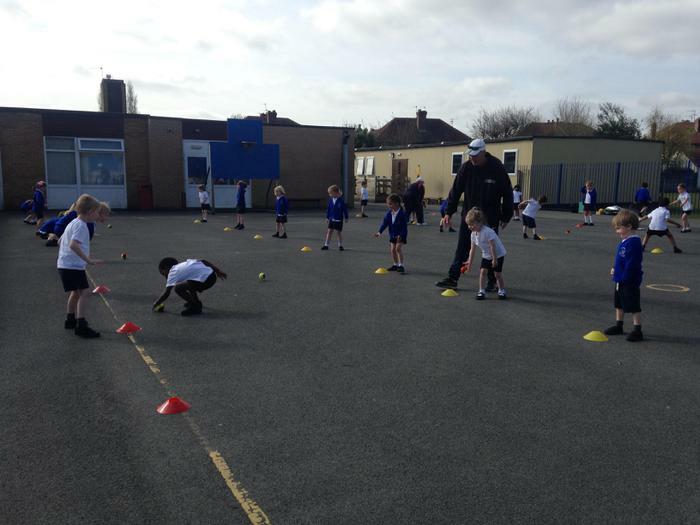 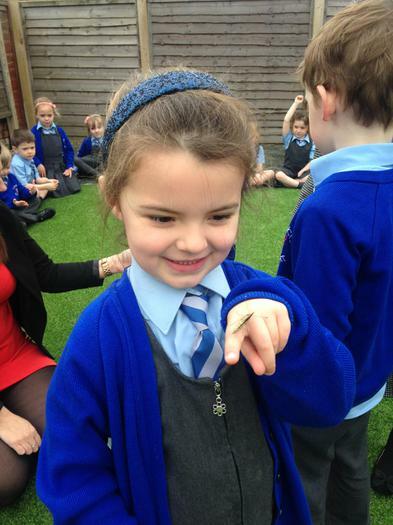 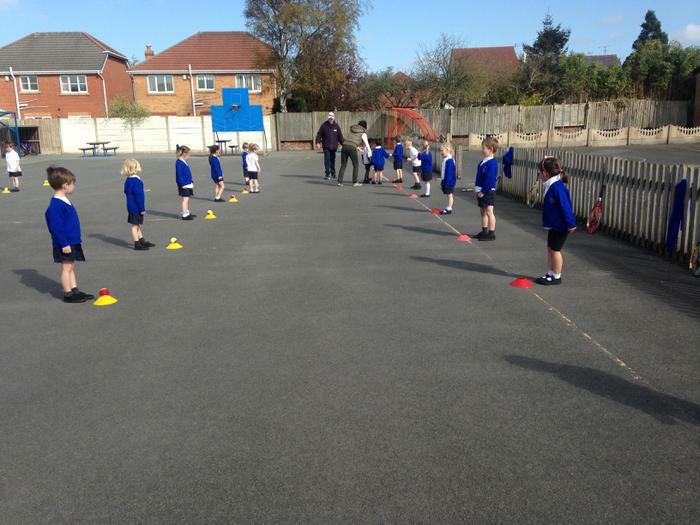 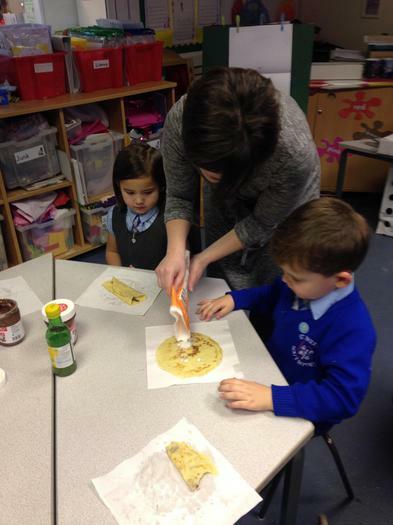 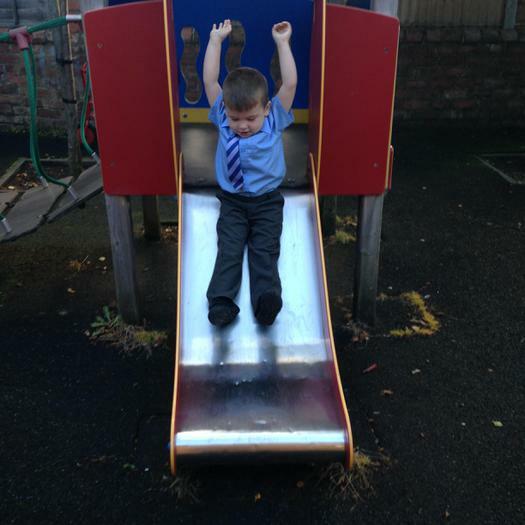 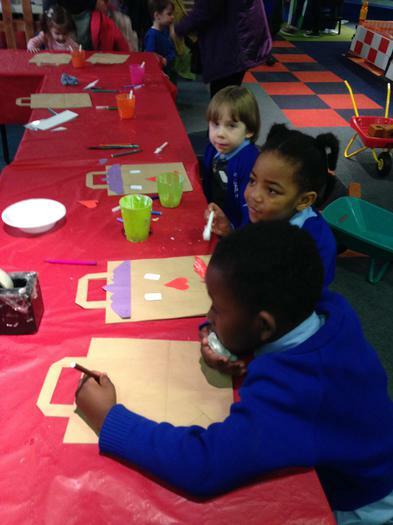 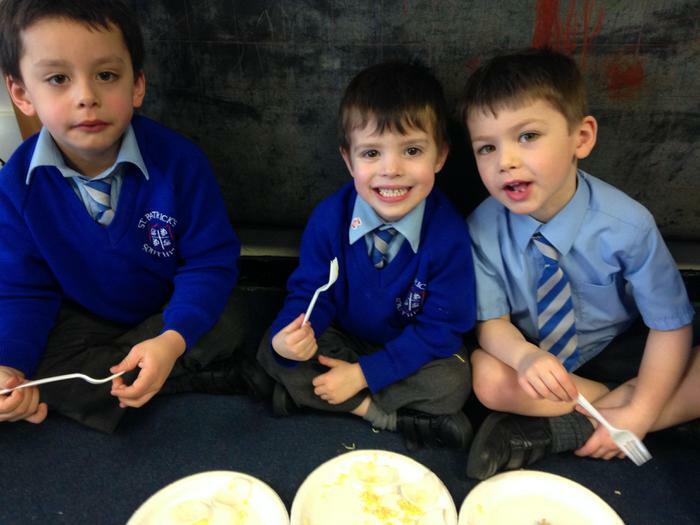 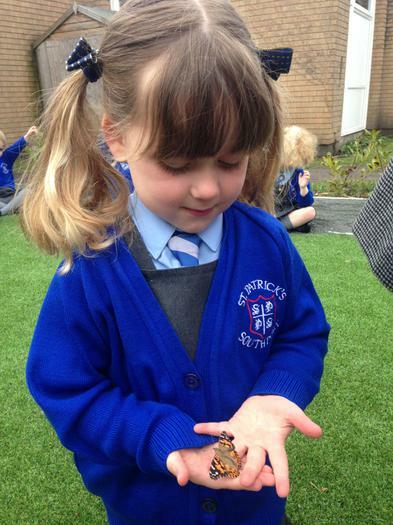 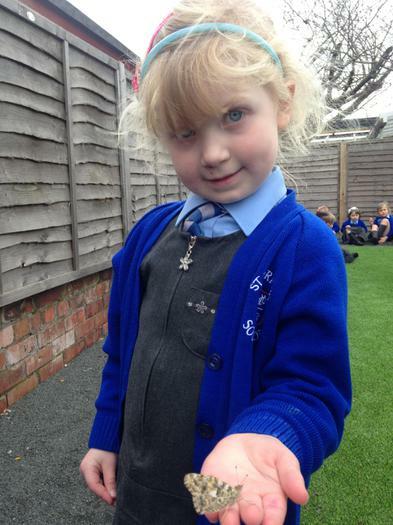 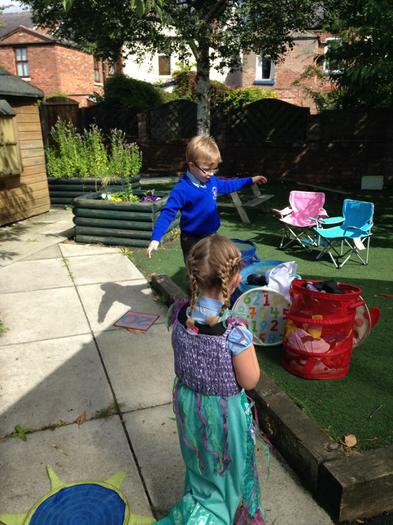 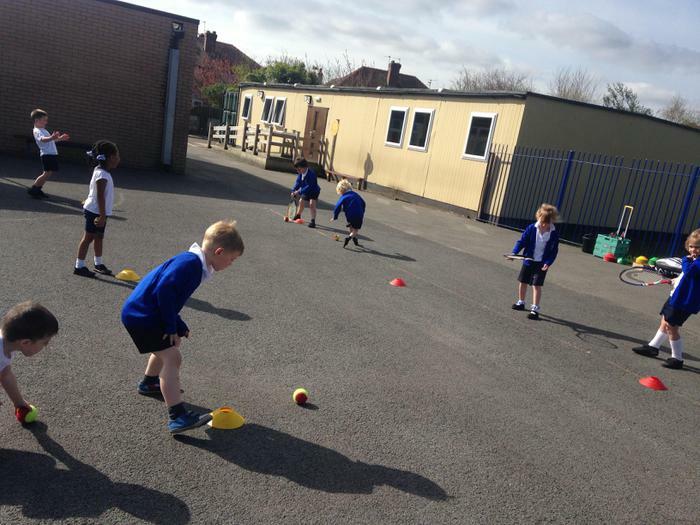 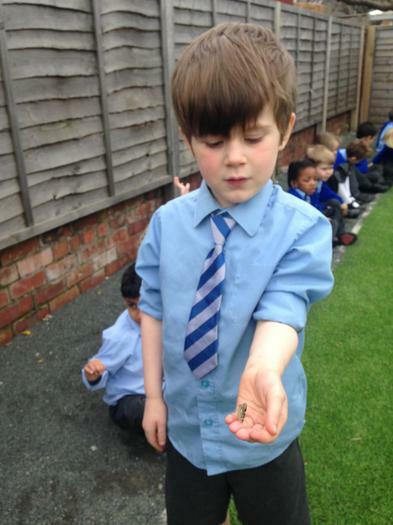 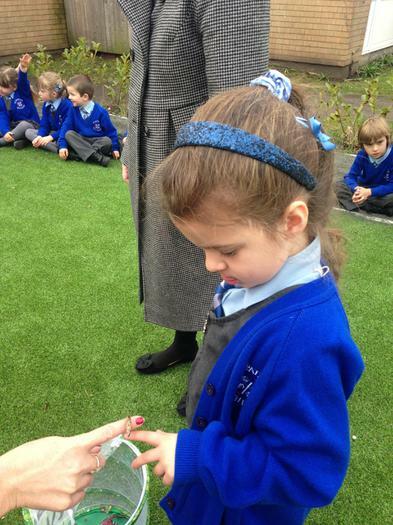 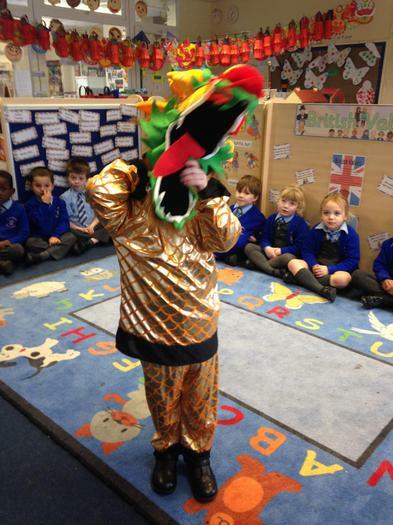 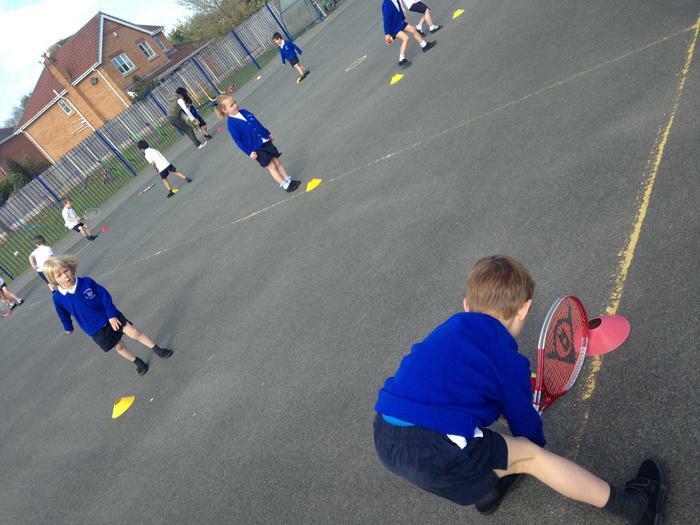 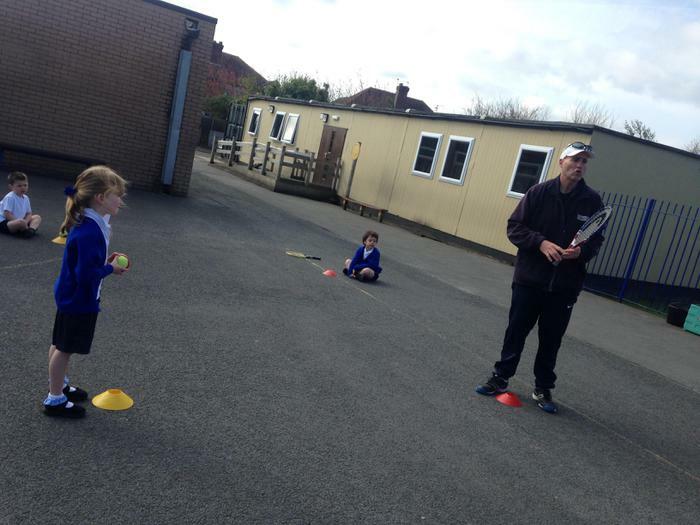 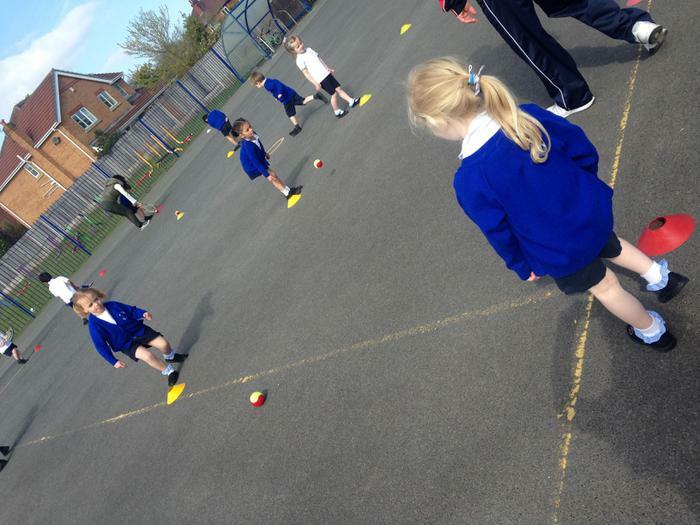 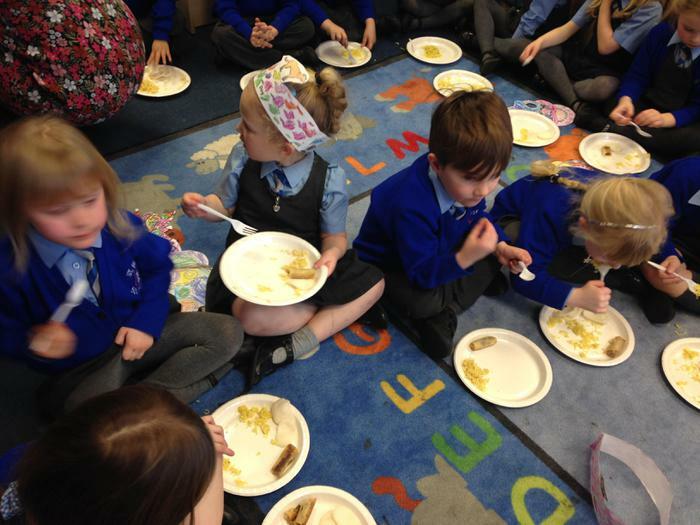 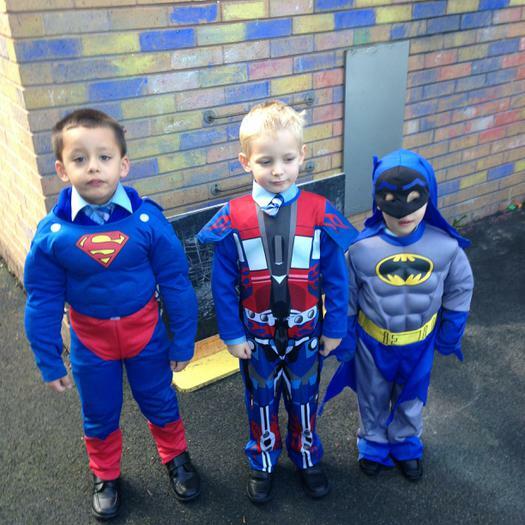 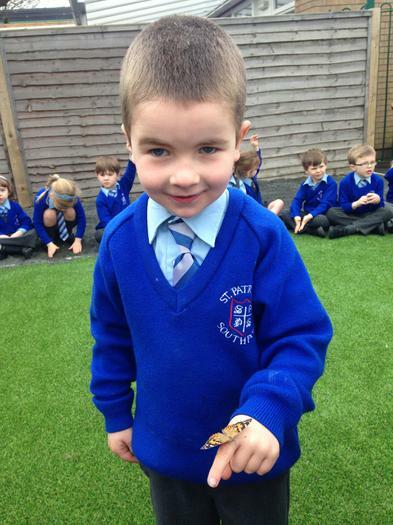 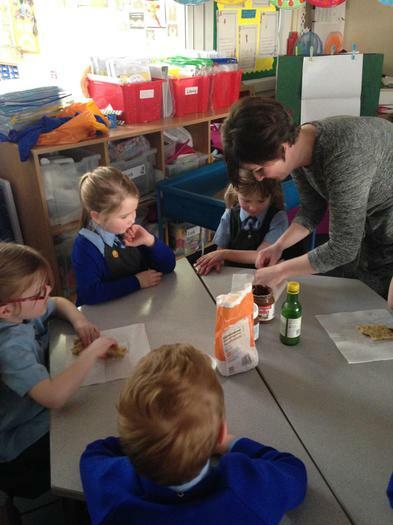 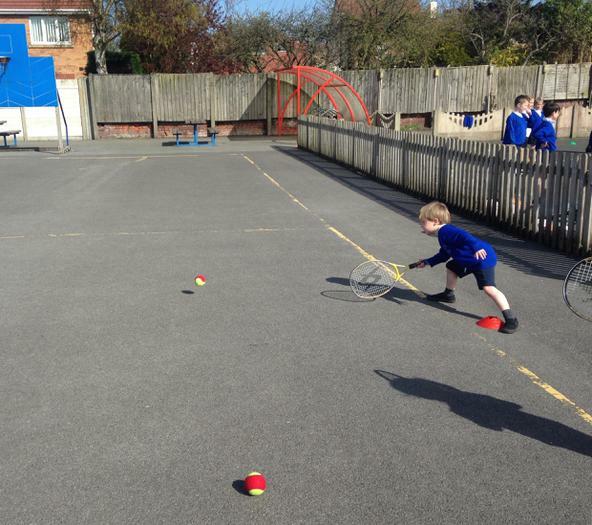 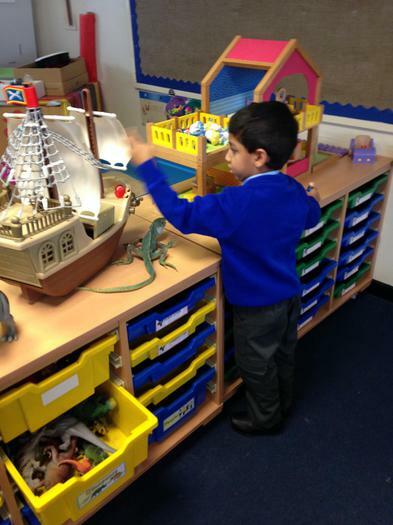 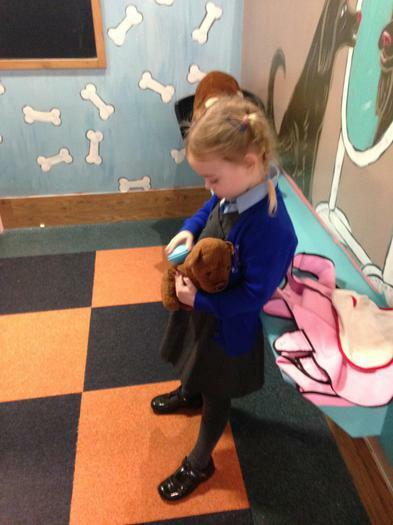 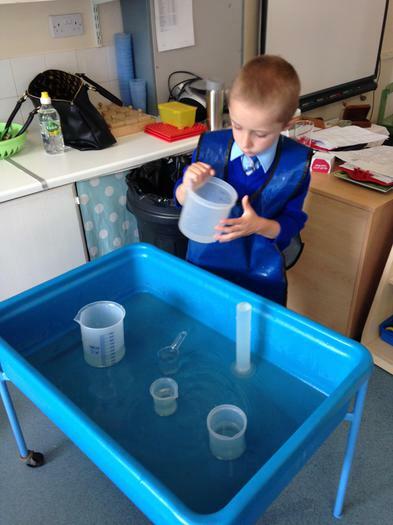 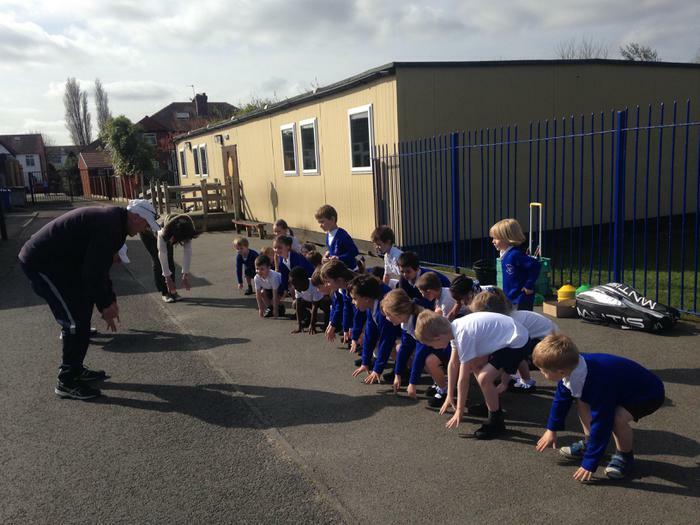 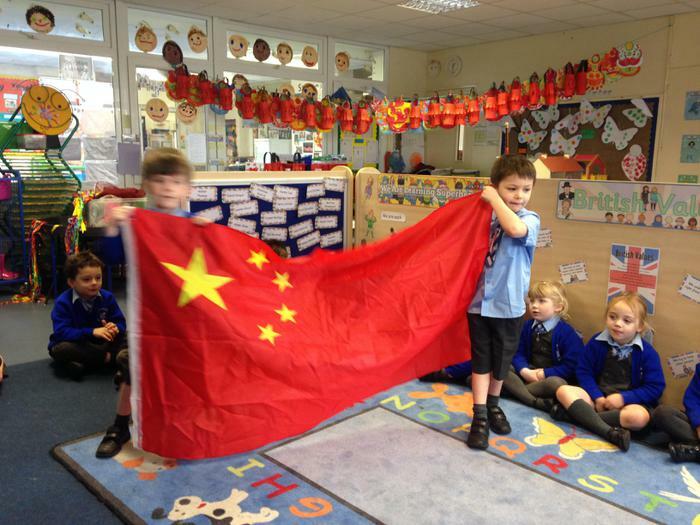 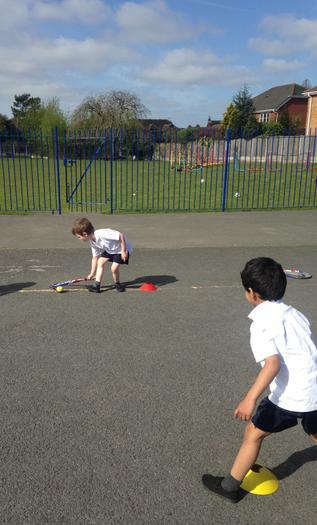 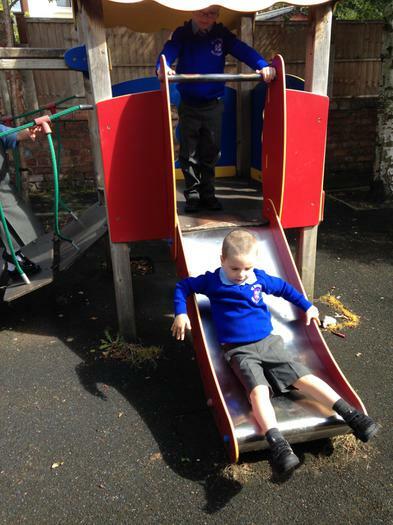 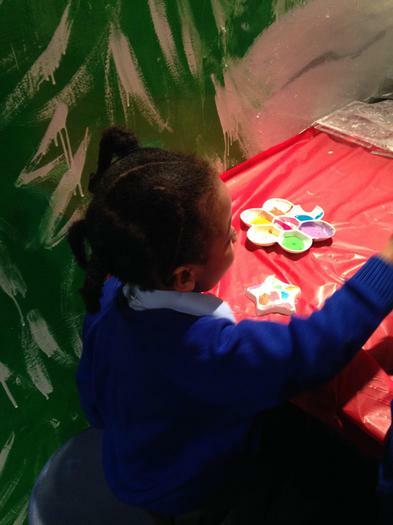 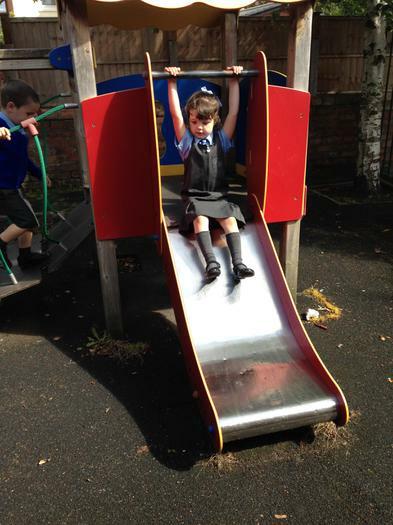 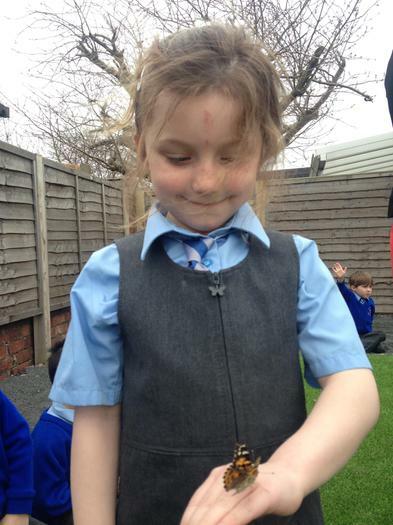 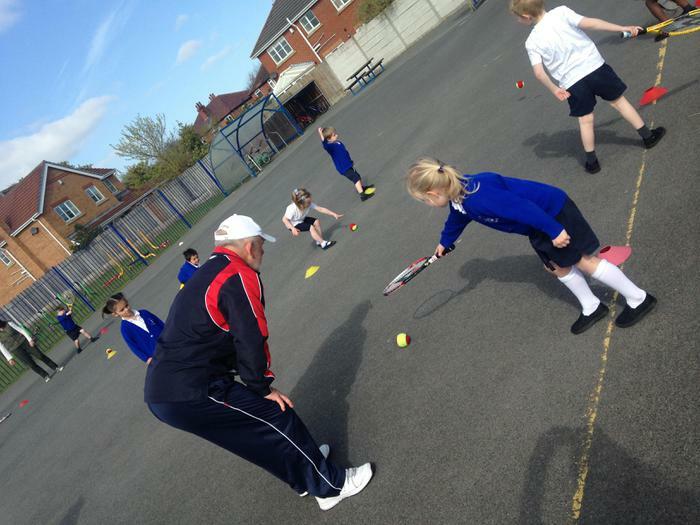 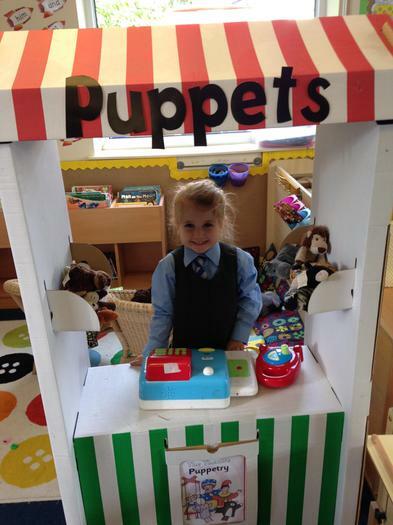 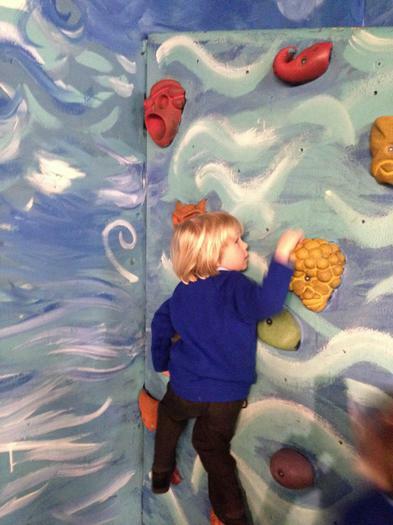 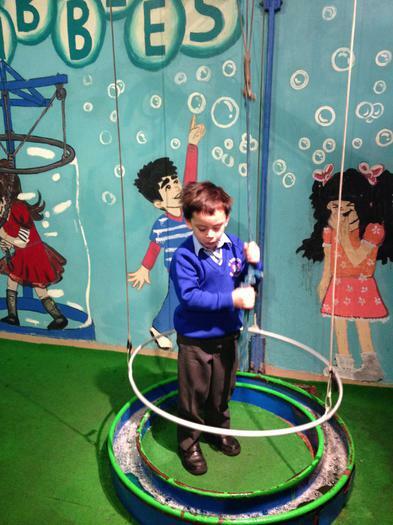 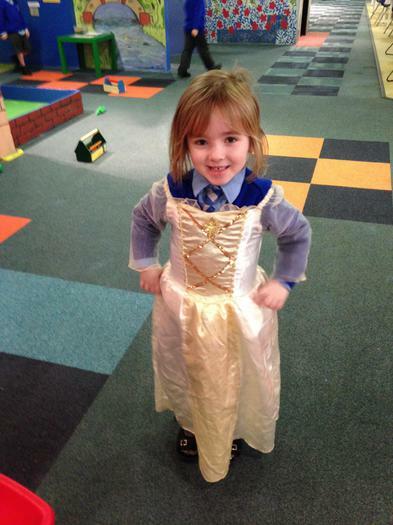 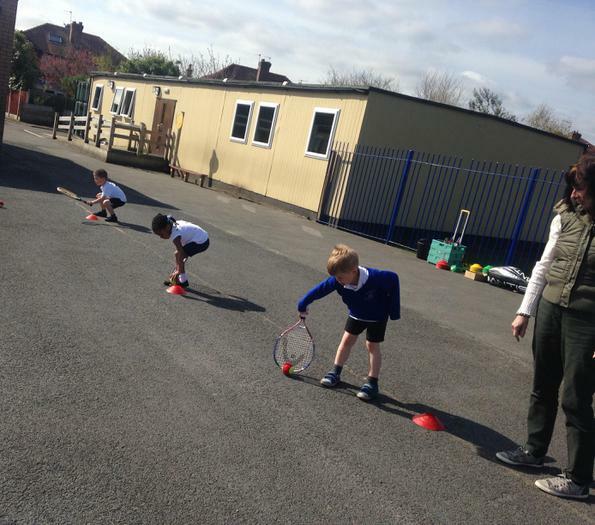 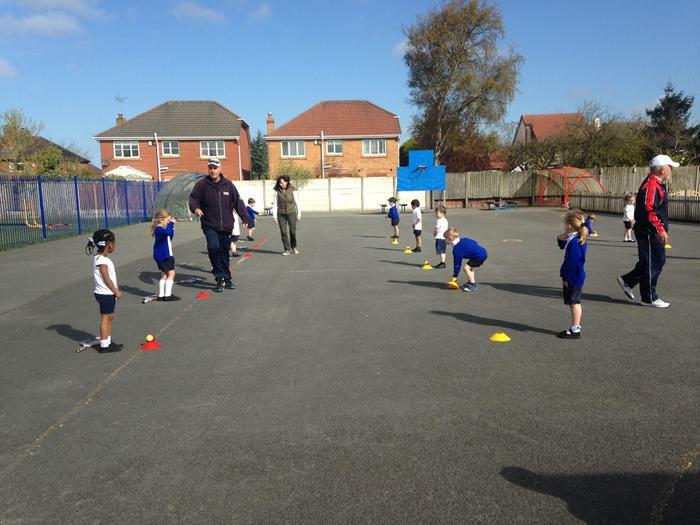 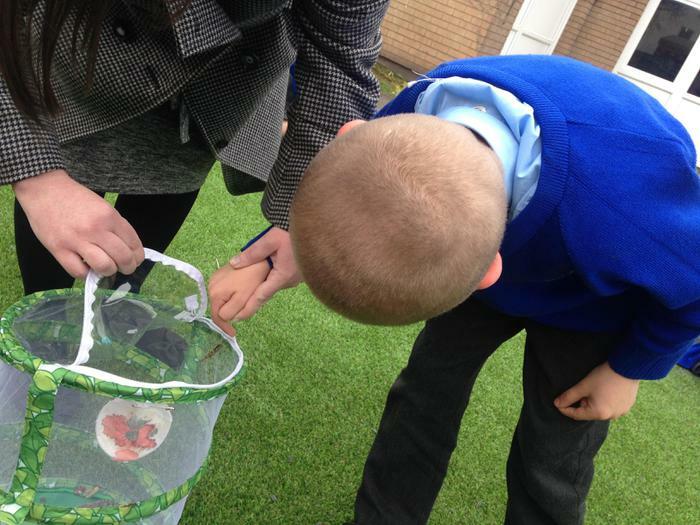 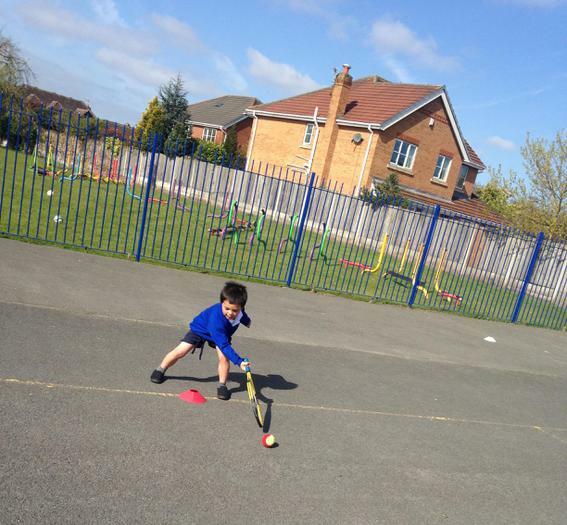 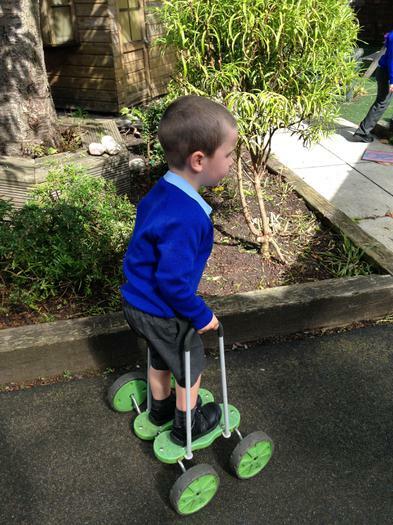 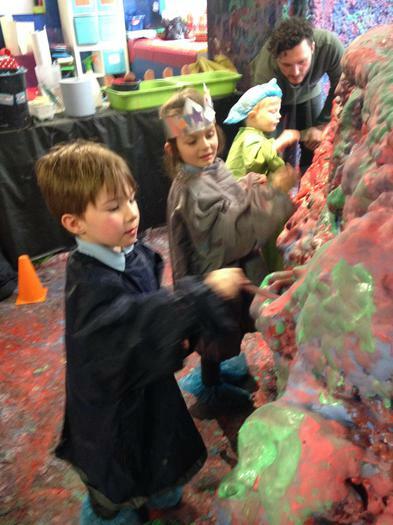 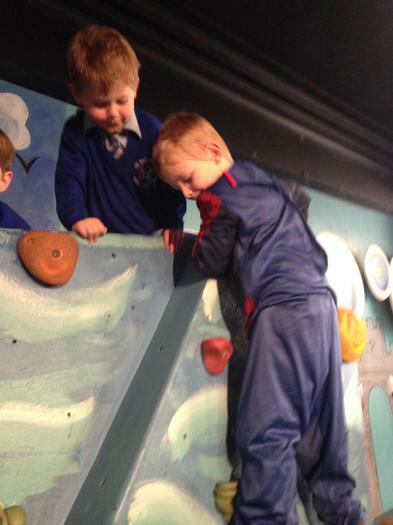 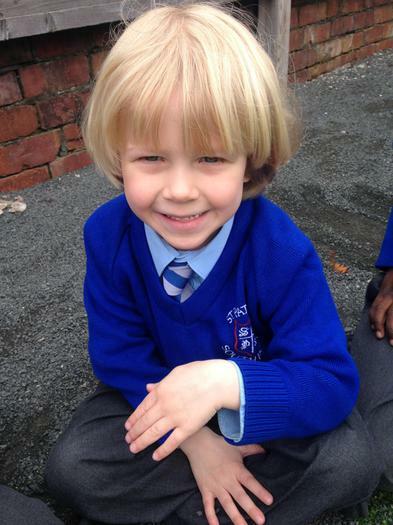 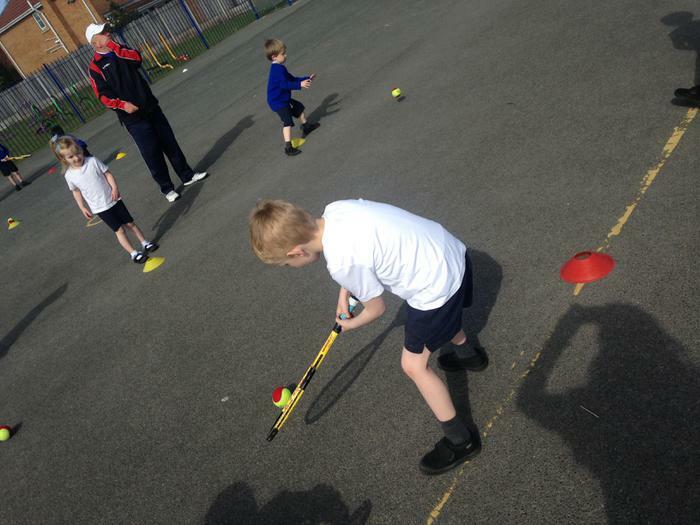 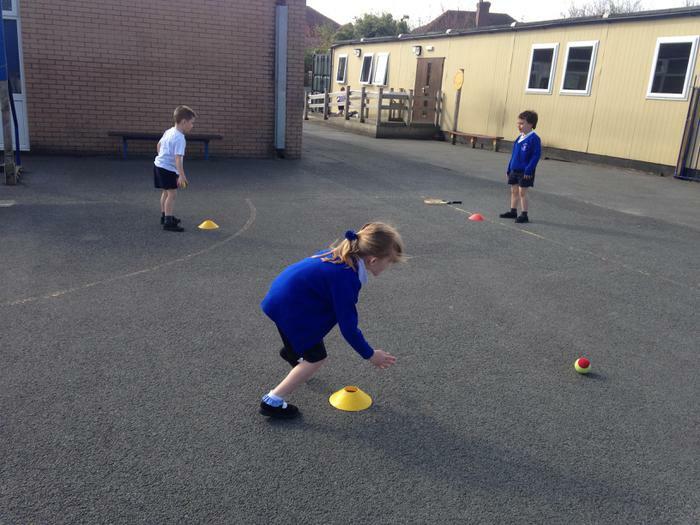 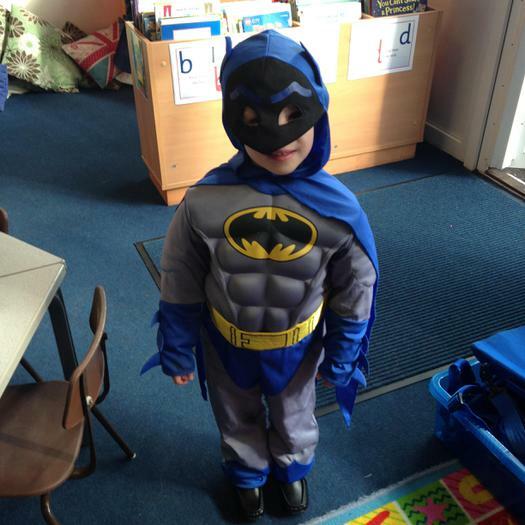 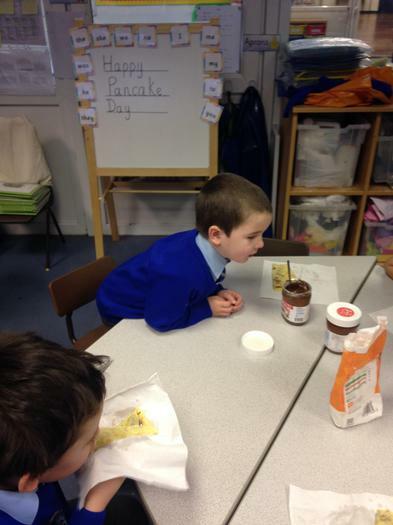 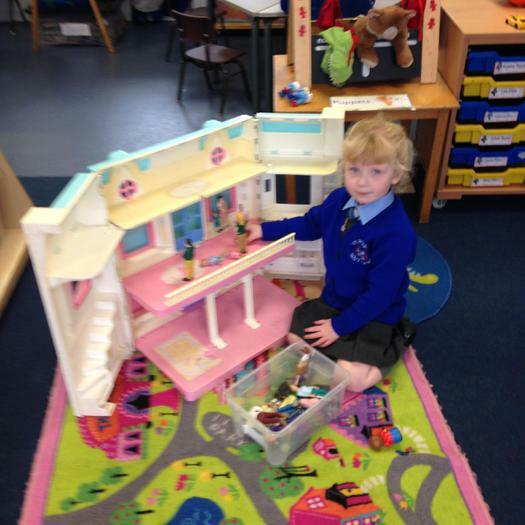 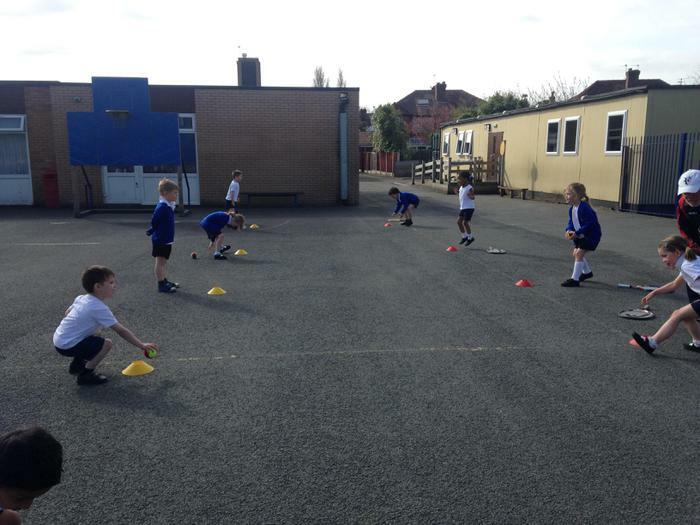 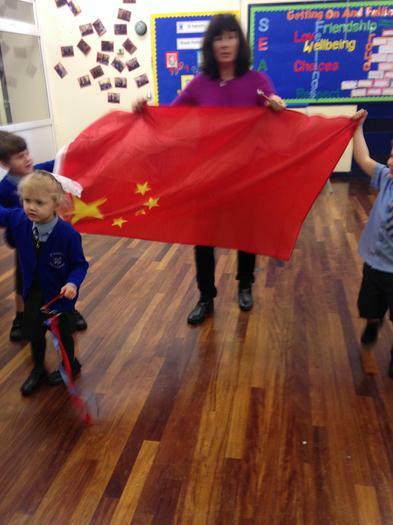 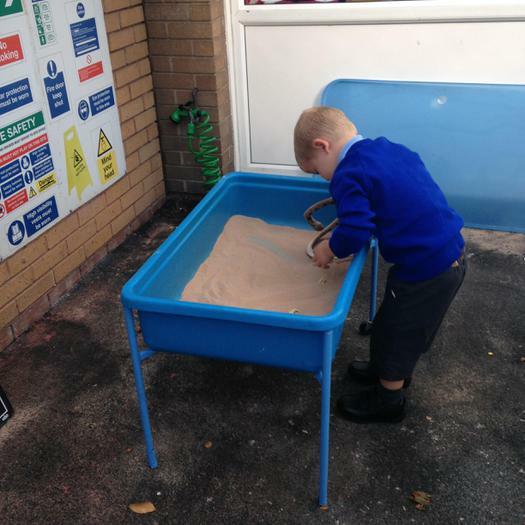 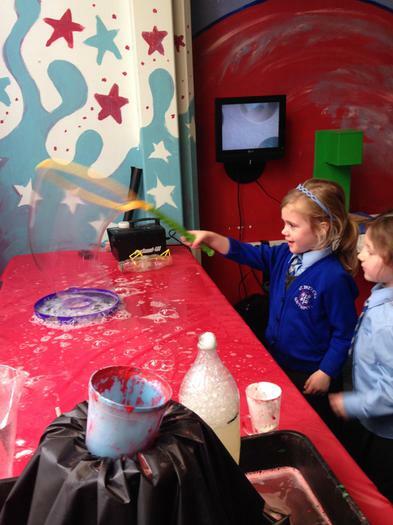 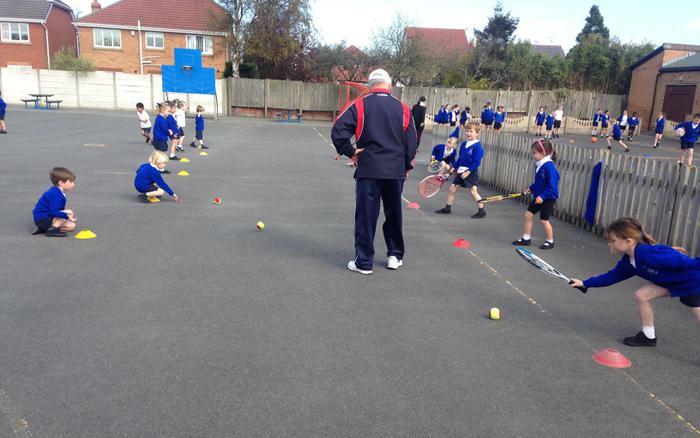 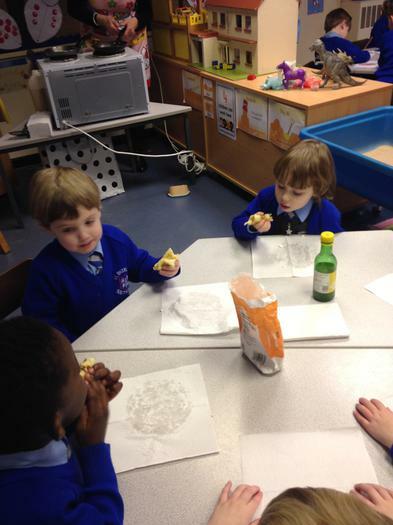 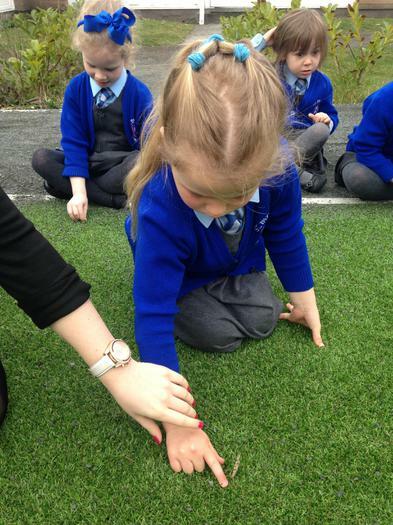 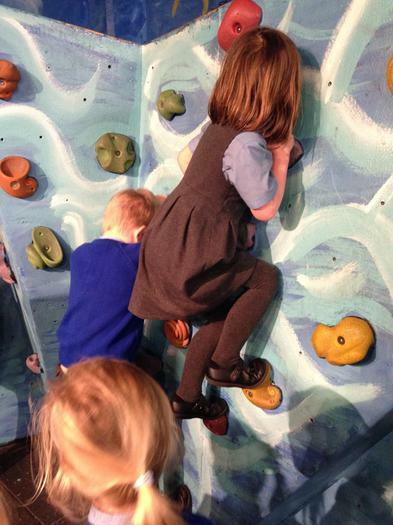 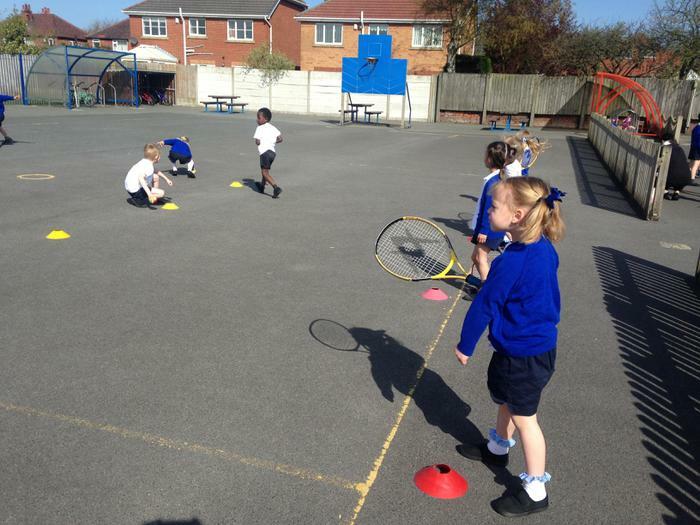 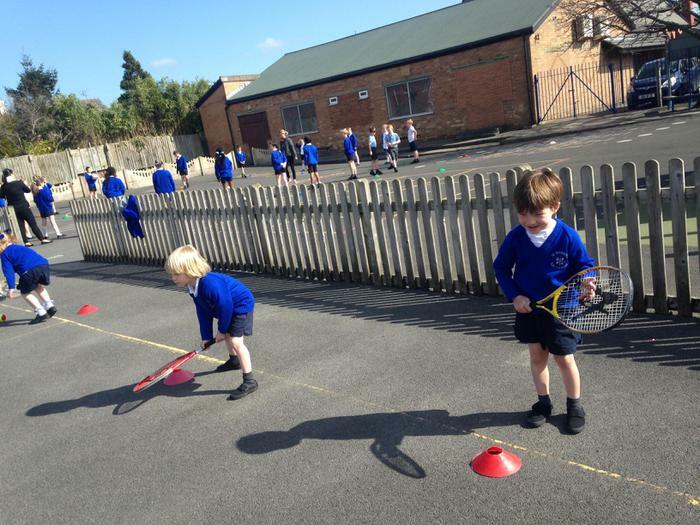 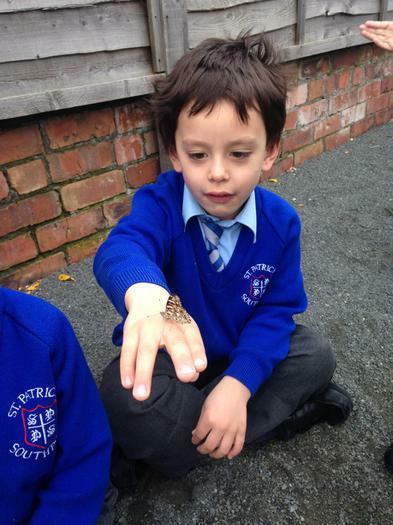 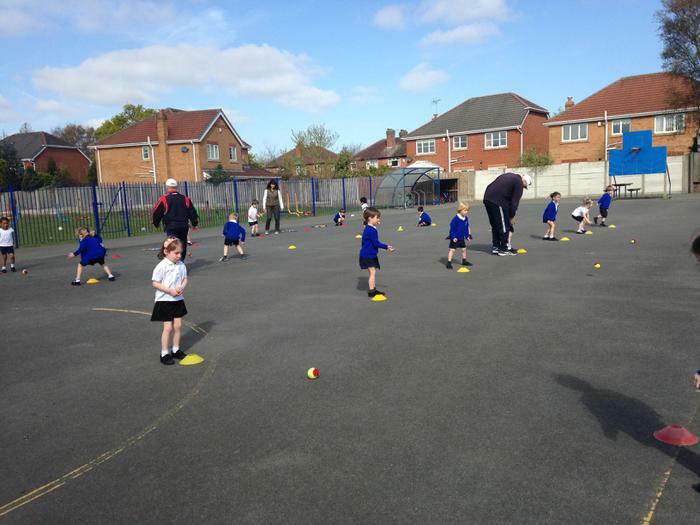 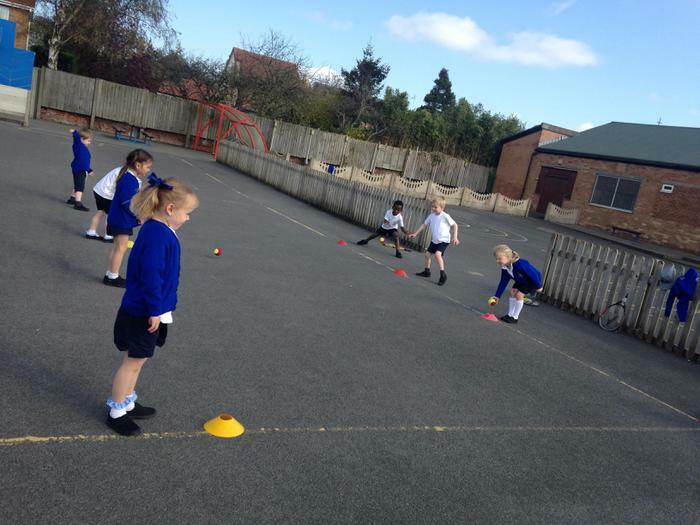 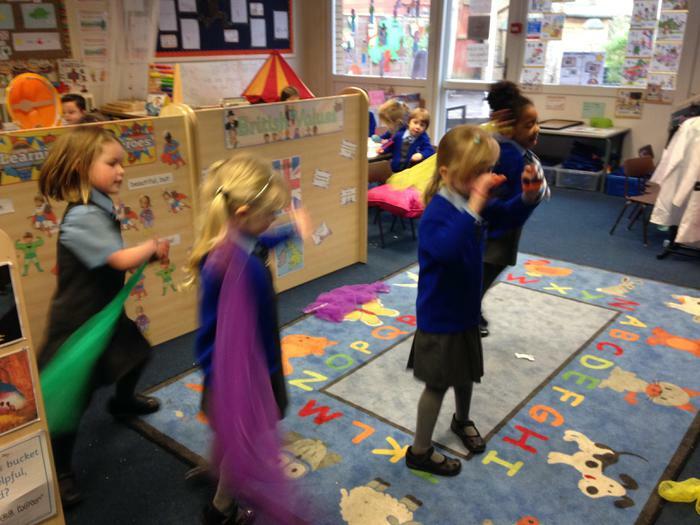 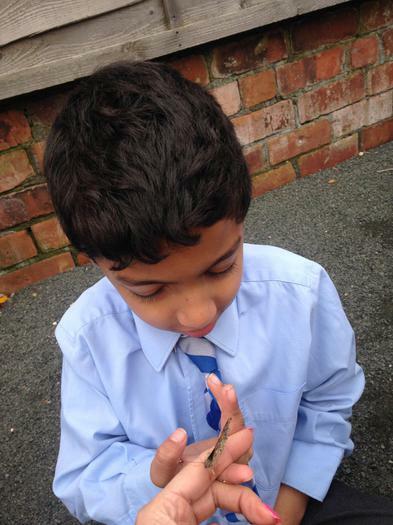 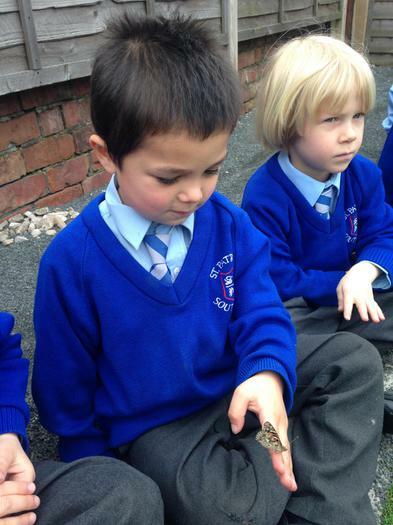 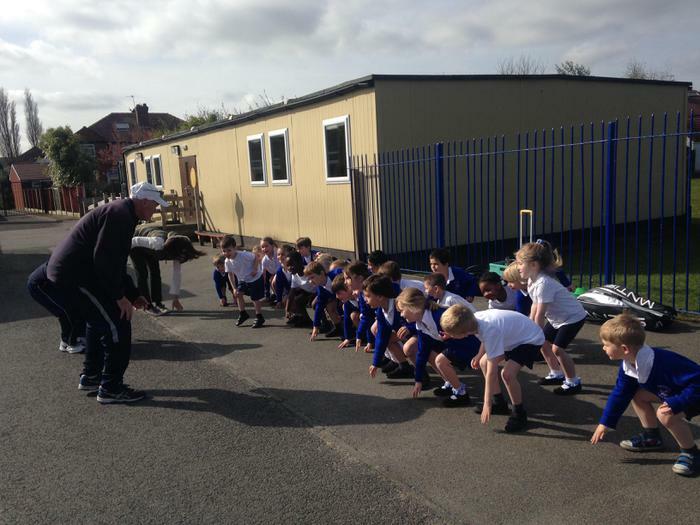 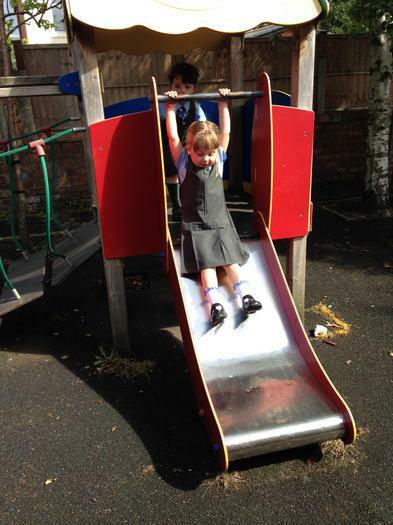 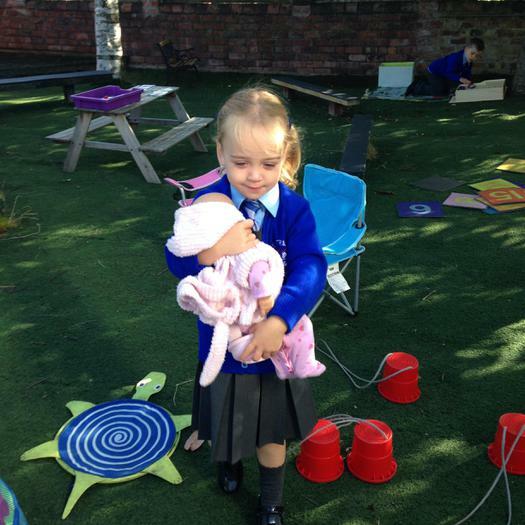 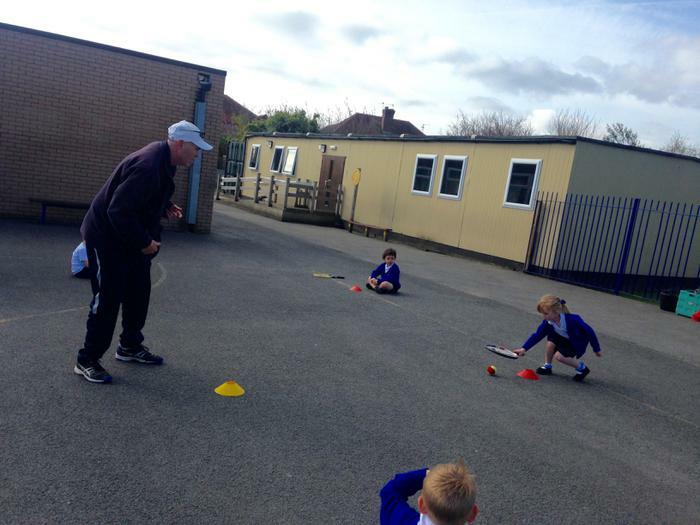 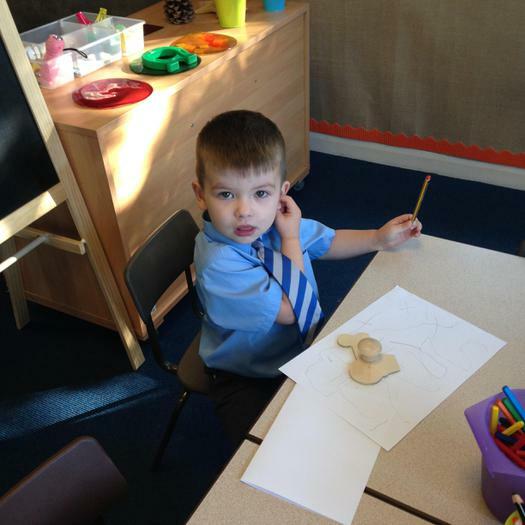 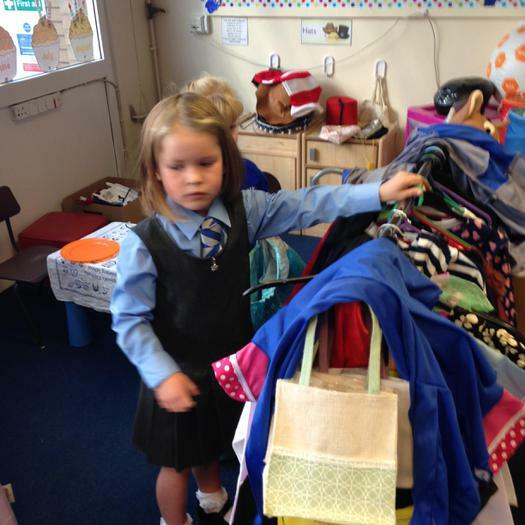 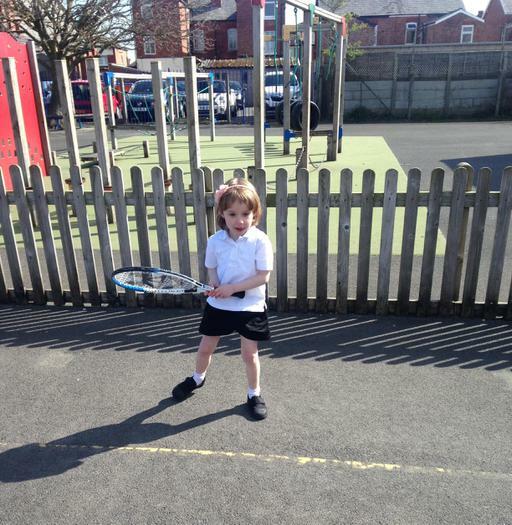 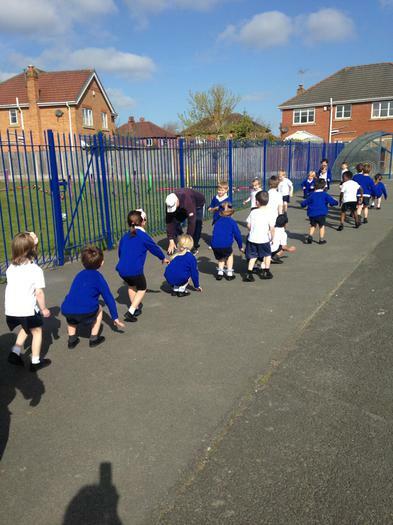 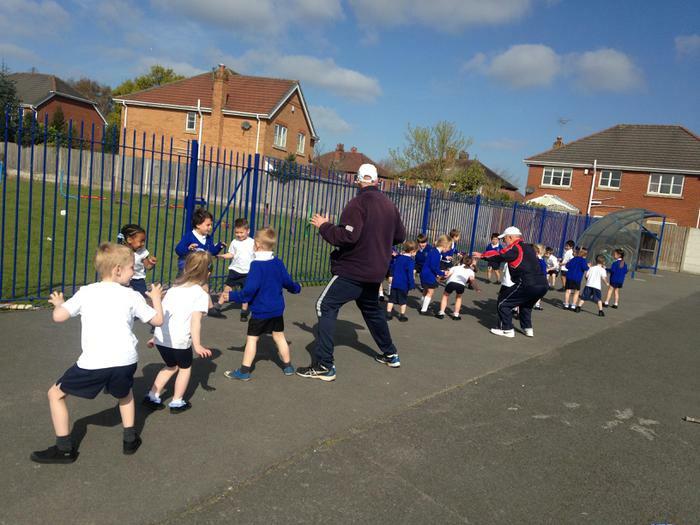 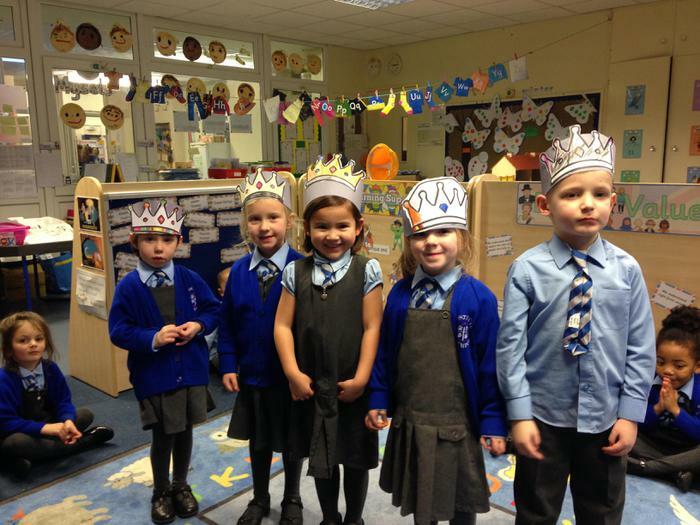 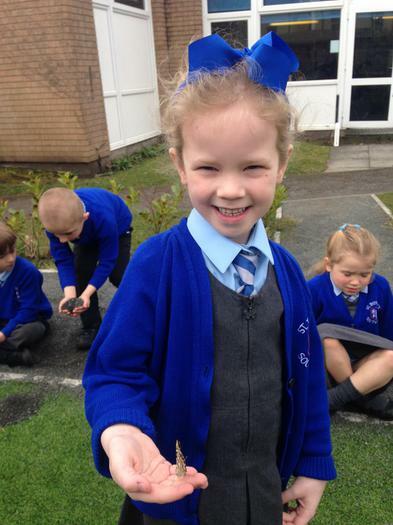 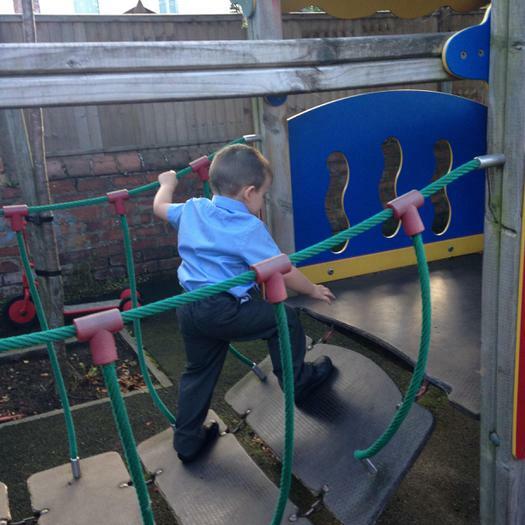 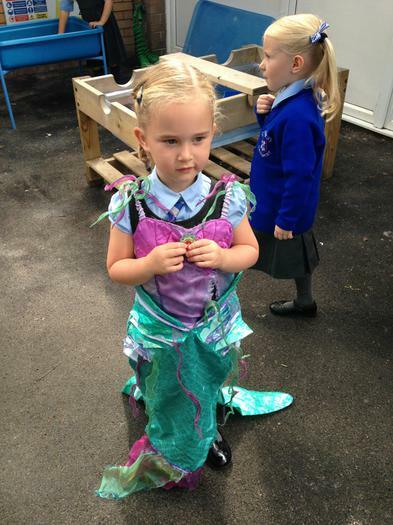 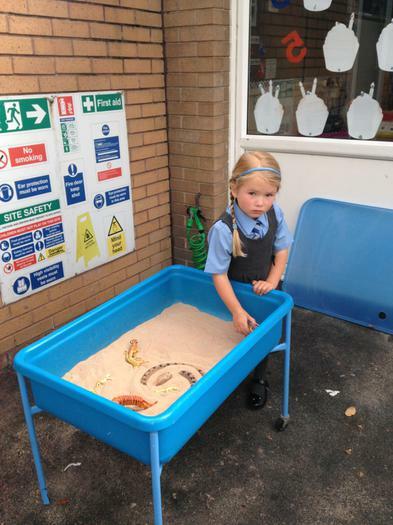 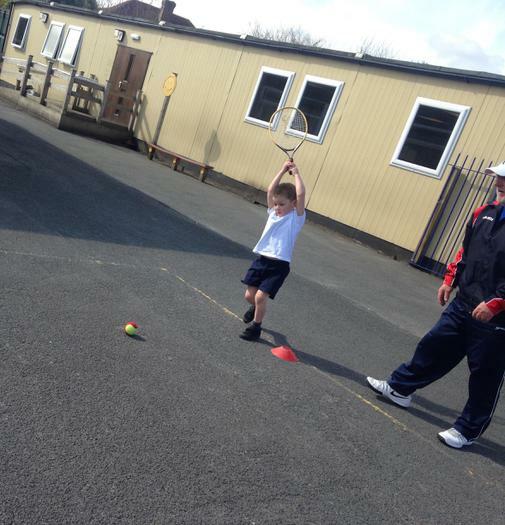 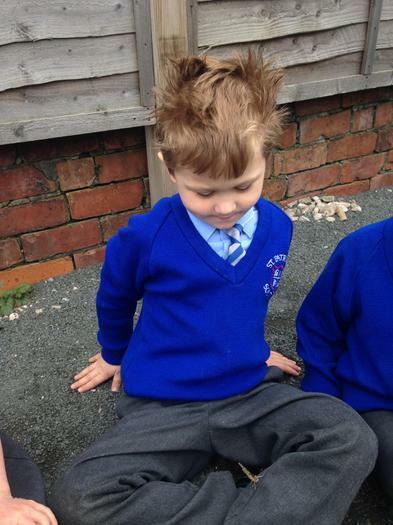 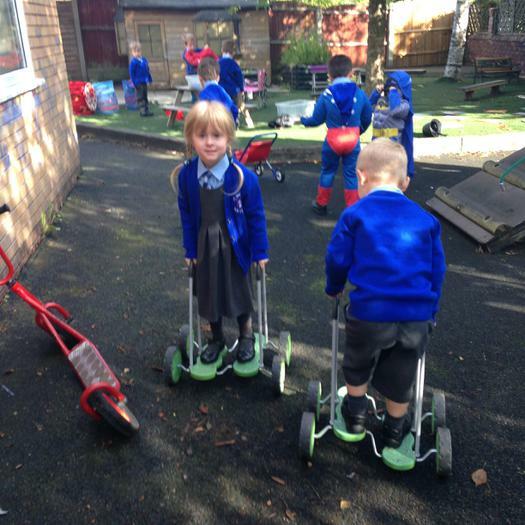 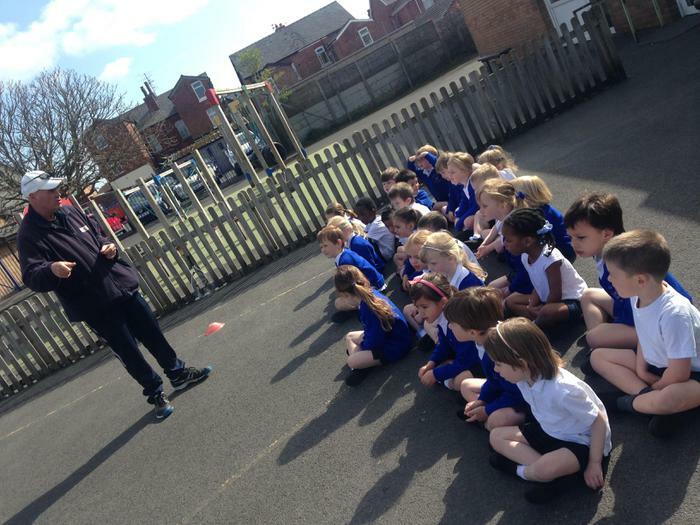 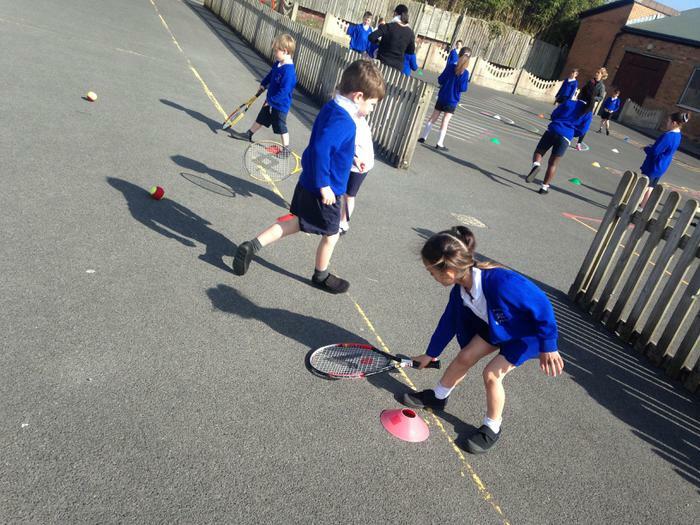 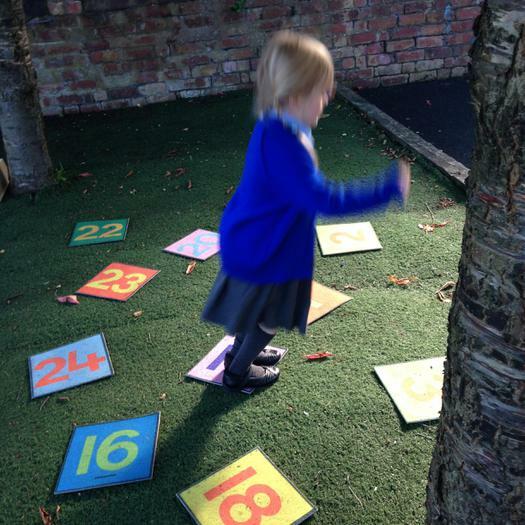 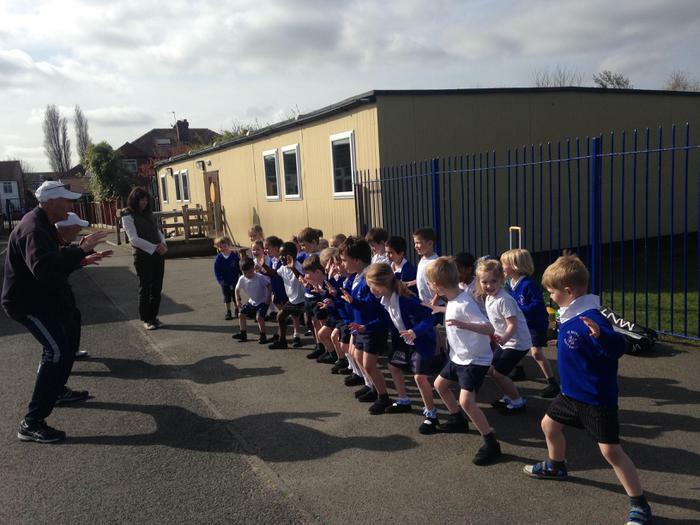 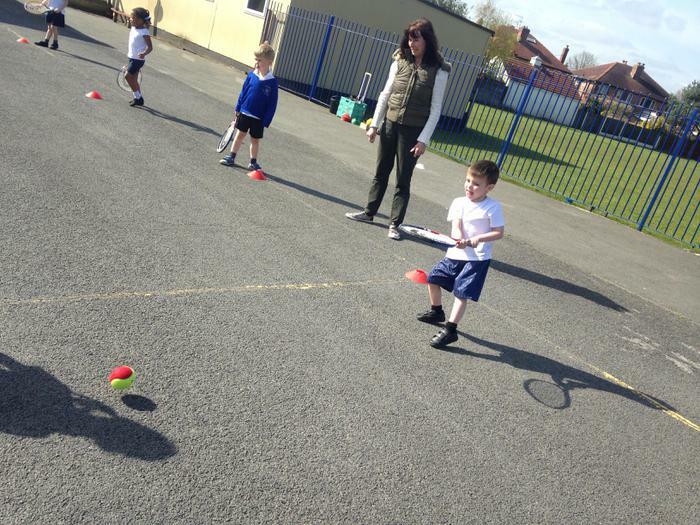 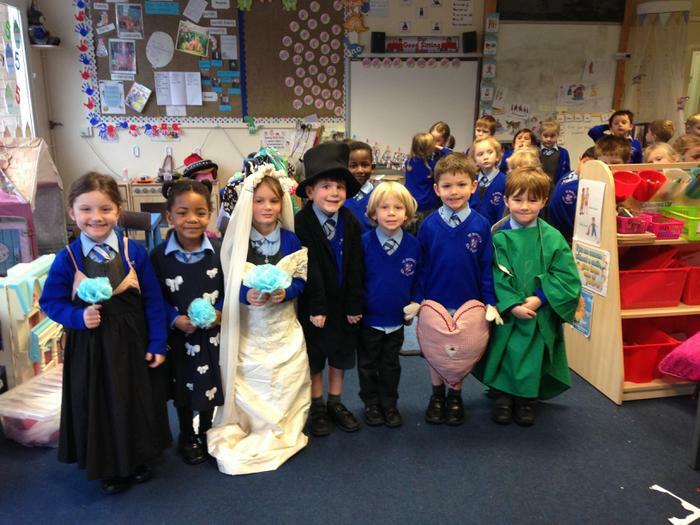 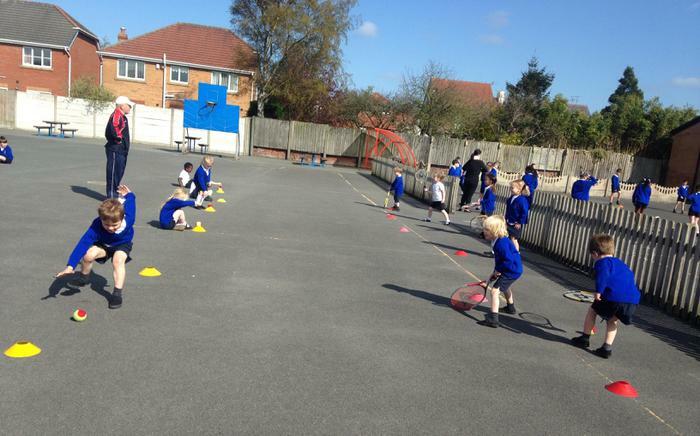 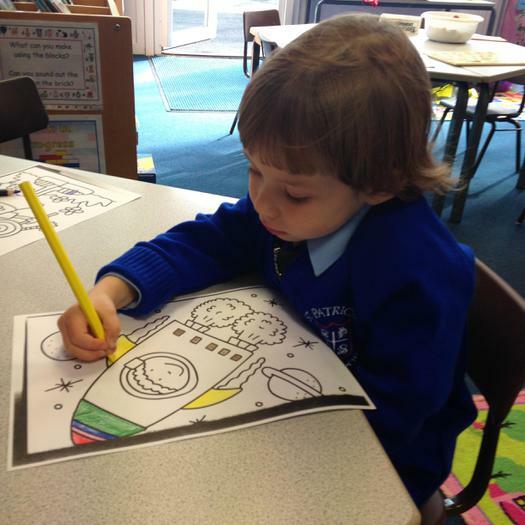 We run our Foundation Stage as a unit so all children have access to all areas of our provision throughout the day. 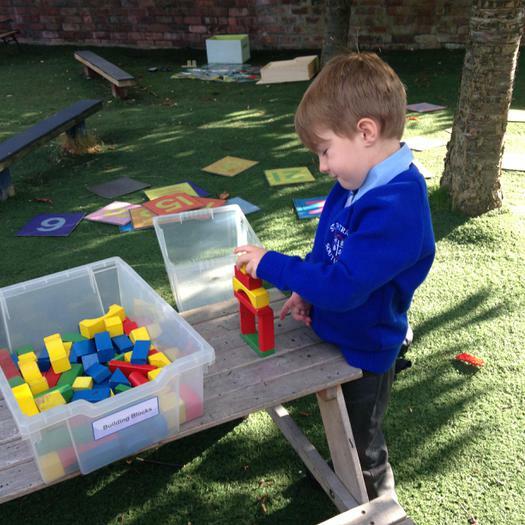 This means that even though we have our own class teacher and key person, all the children have opportunities to work with both teachers and teaching assistants. 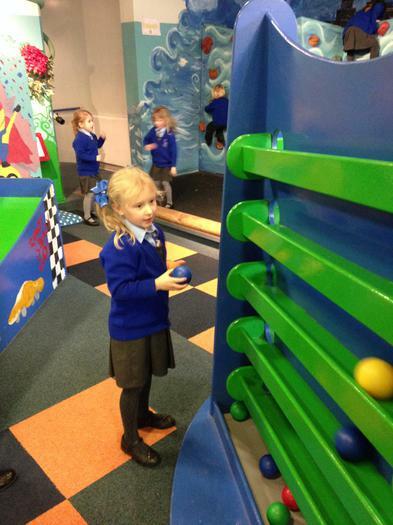 Our day begins with Early Doors at 8.45am: children are welcome to arrive anytime between 8.45am and 8.55am. 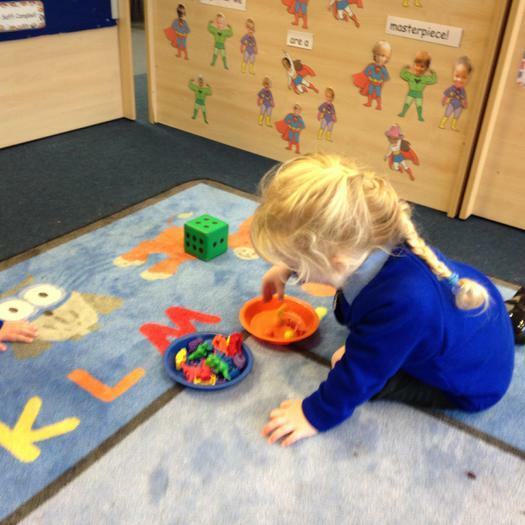 Then we are ready to learn our Letters and Sounds. 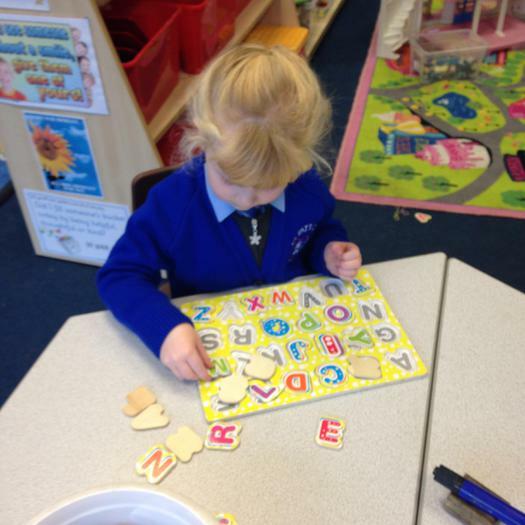 Each day we learn a new letter or sound. 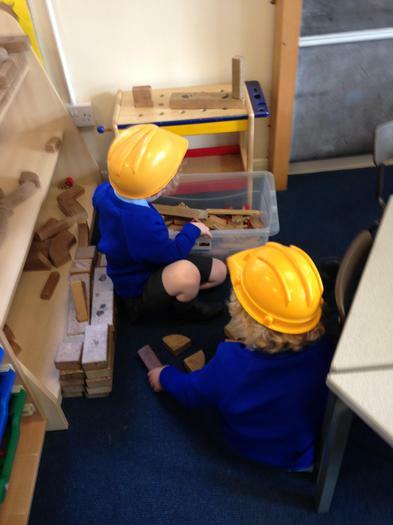 After this we have some time to choose our own activities or we work with an adult. 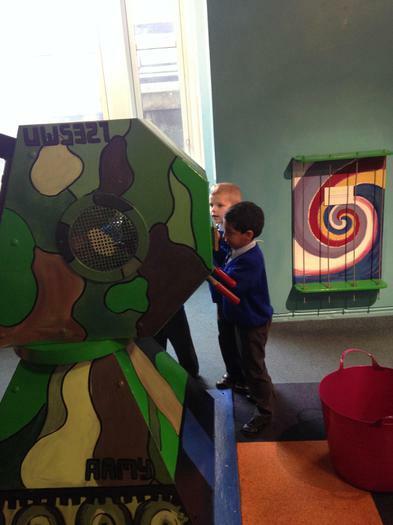 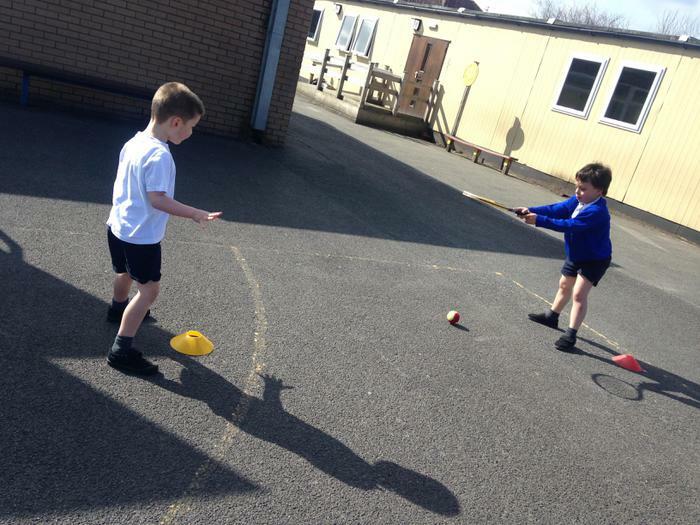 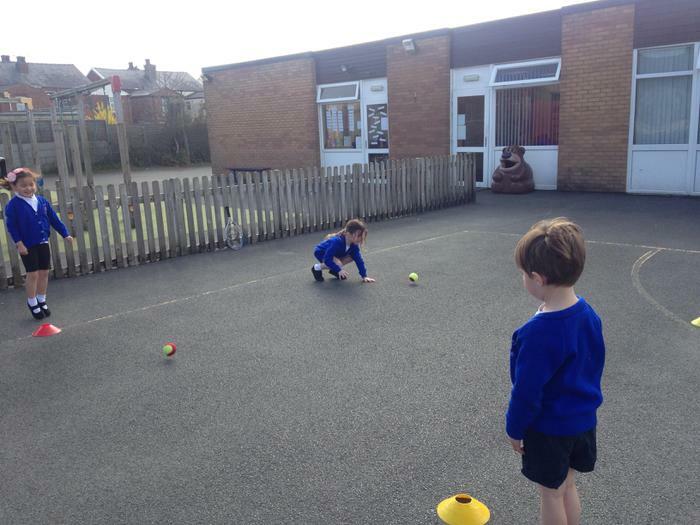 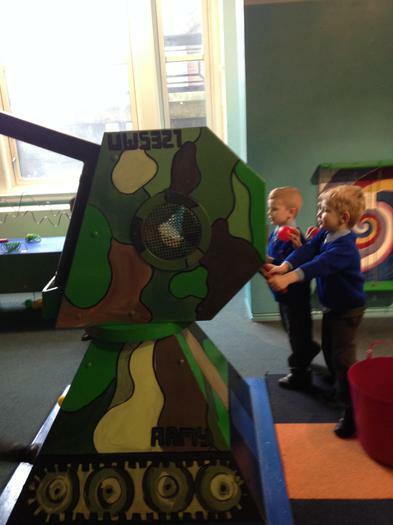 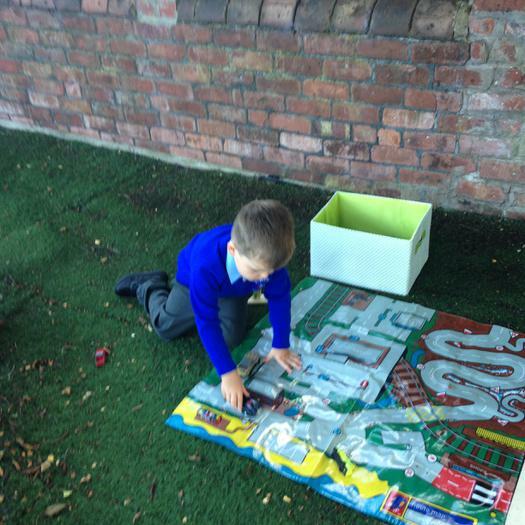 At this time we also set up our outdoor area activities so that we can play inside or out, hail, rain or snow! 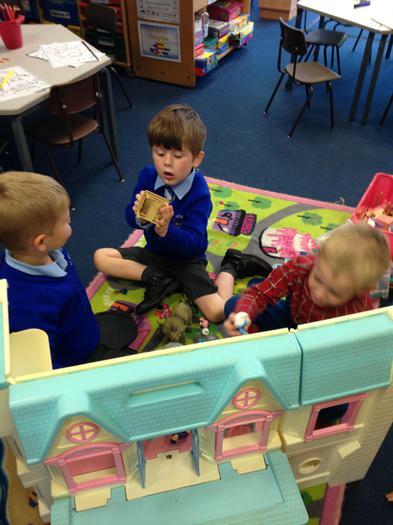 Before playtime we sit down for snack and milk. 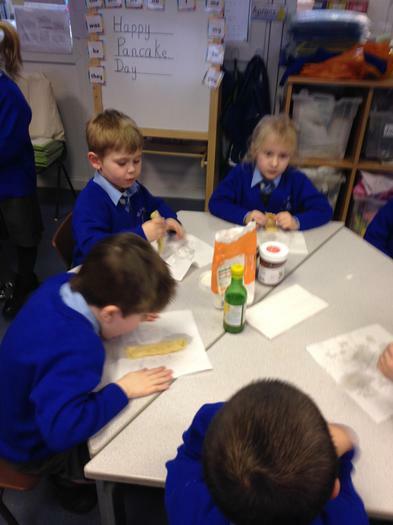 We have a healthy snack each day except on Friday's when we have a treat. 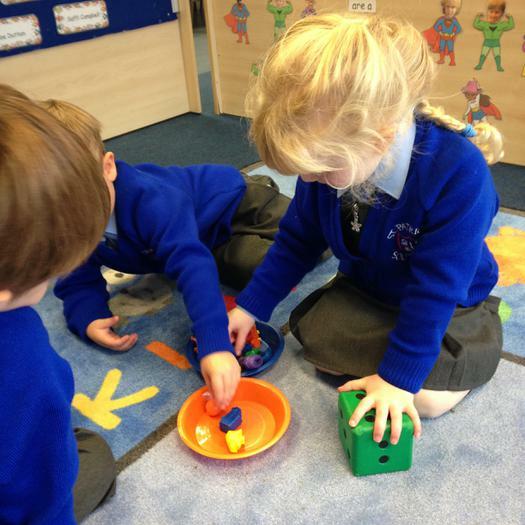 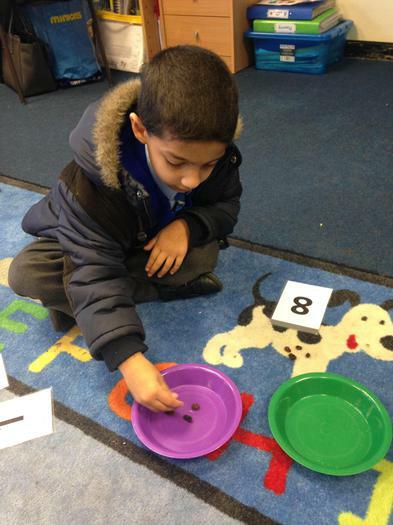 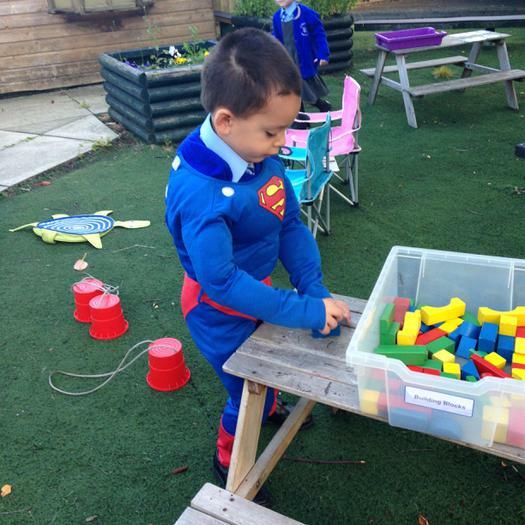 After playtime we take part in Maths activities, which can involve counting, singing, shape games, ICT, water play, sand play and lots of measuring. 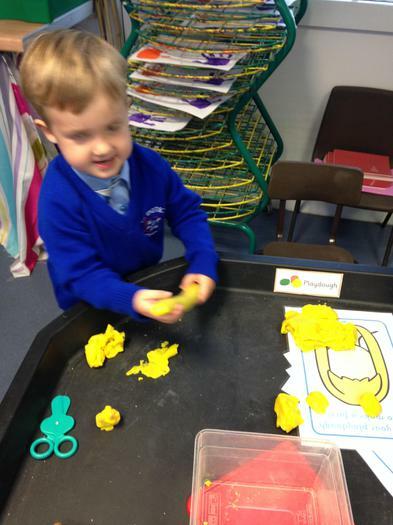 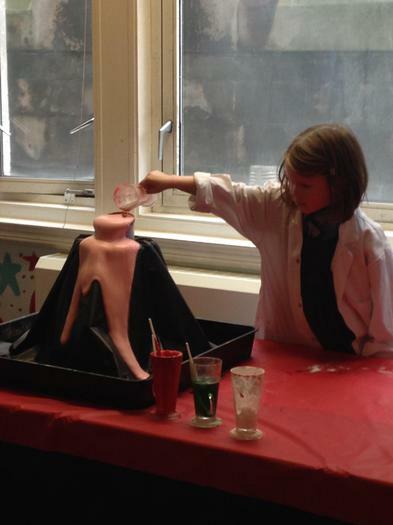 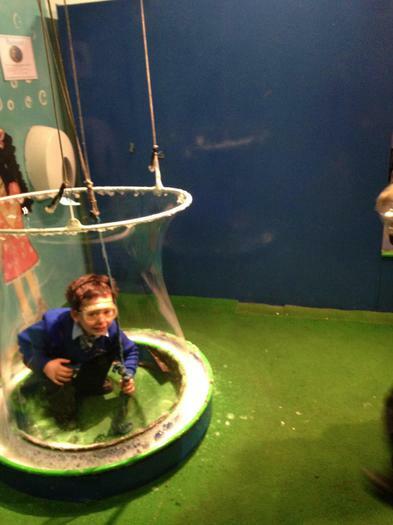 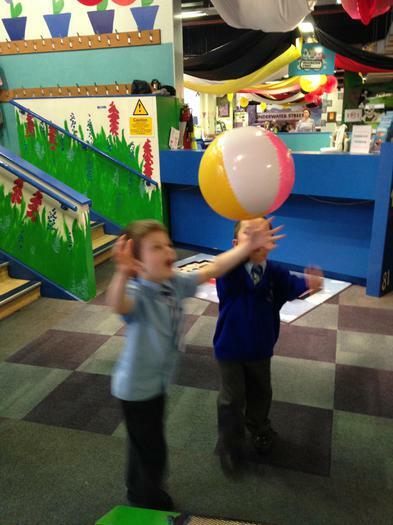 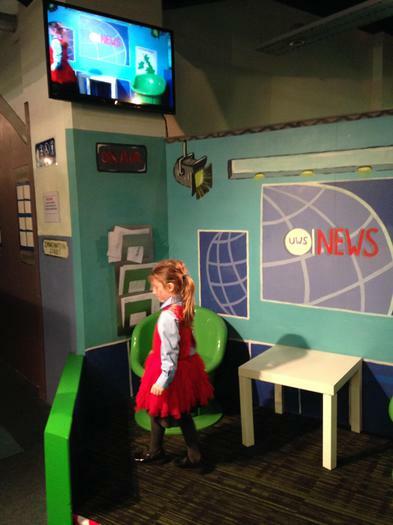 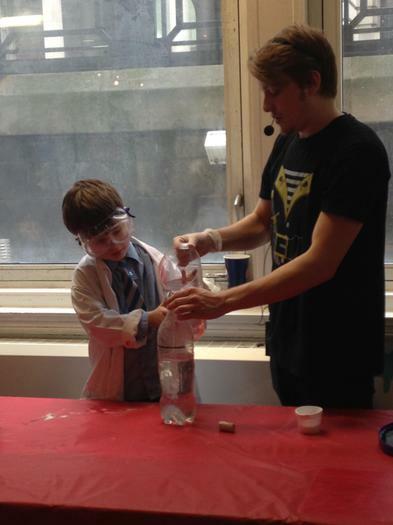 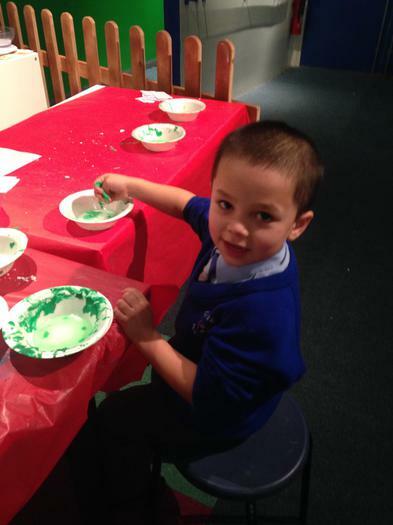 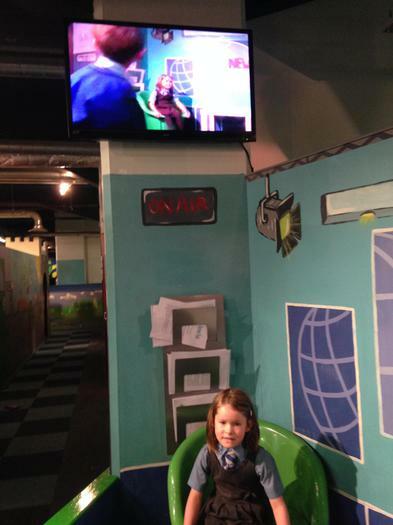 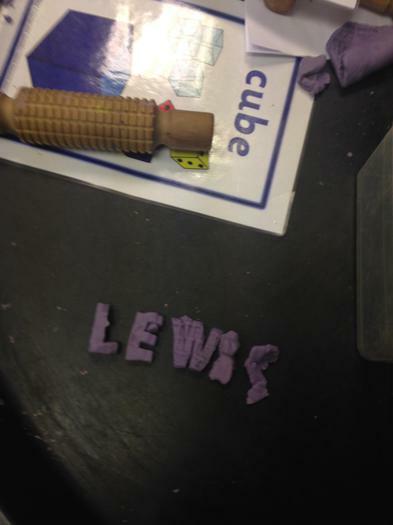 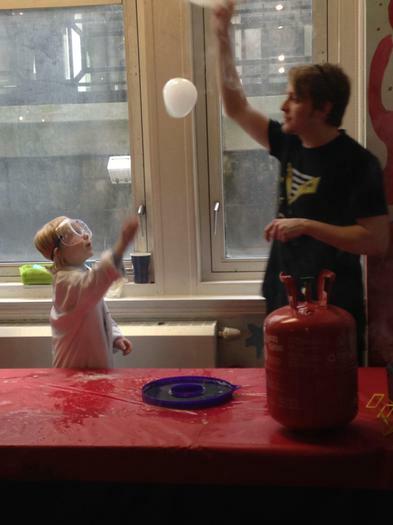 We like to learn through fun, practical games and activities. 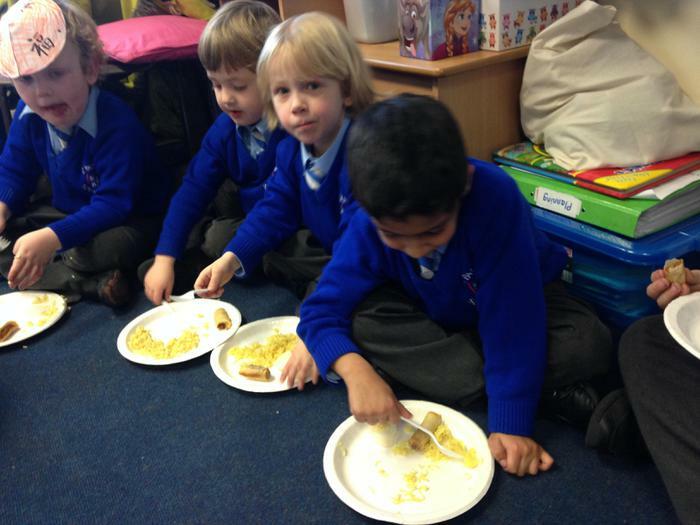 Lunchtime starts at 11.55am. 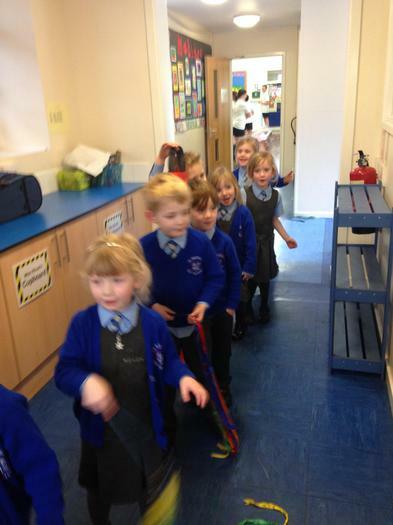 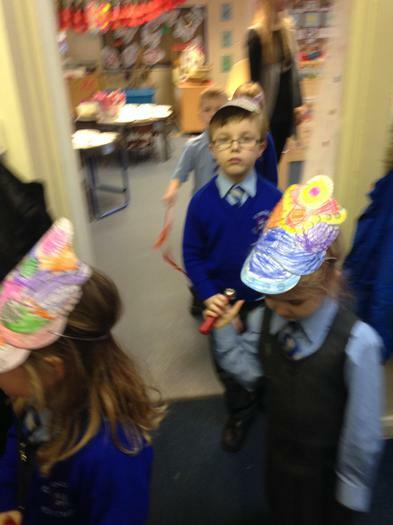 We go into the hall five minutes before the other children so we can get settled. 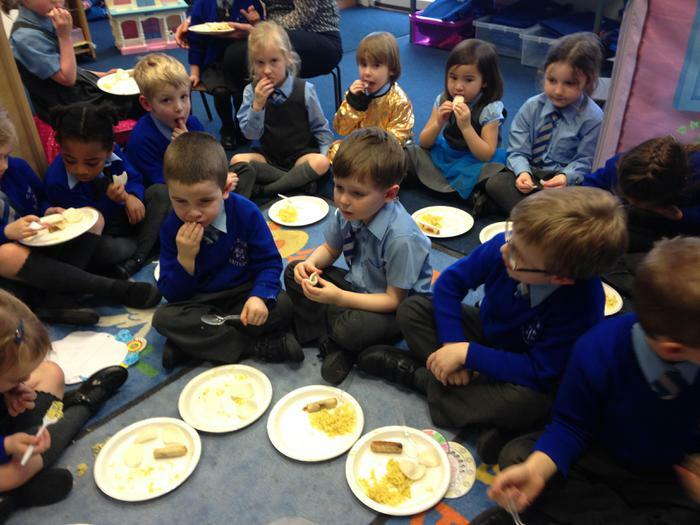 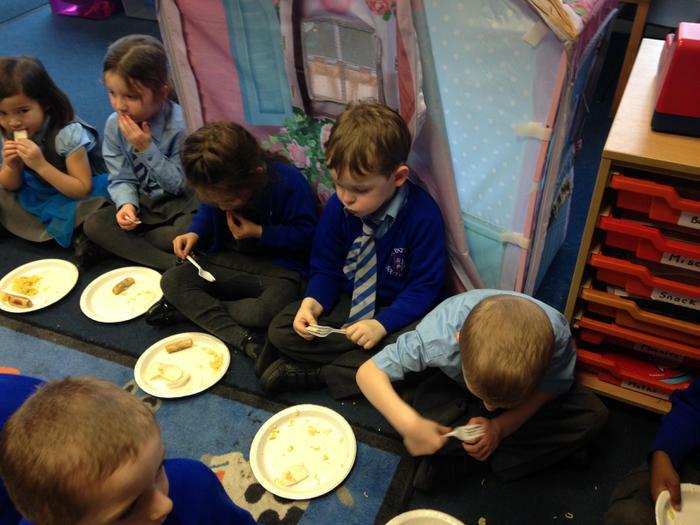 Most of us have hot dinners and some children bring in a packed lunch. 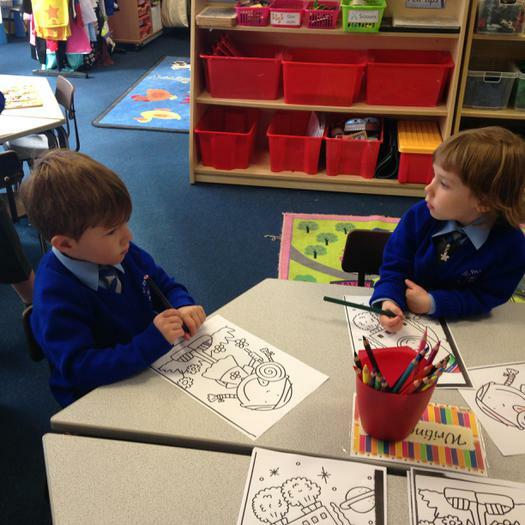 At 1.15pm we go back into class for the afternoon session. 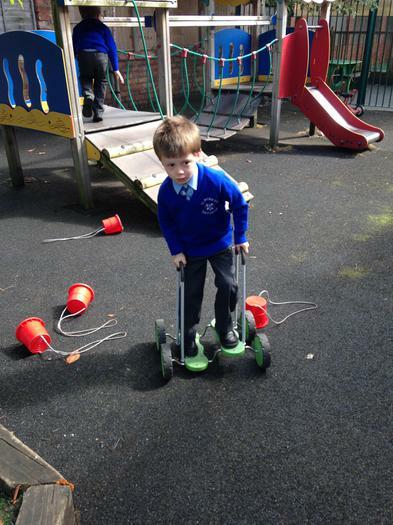 Each day we do different things. 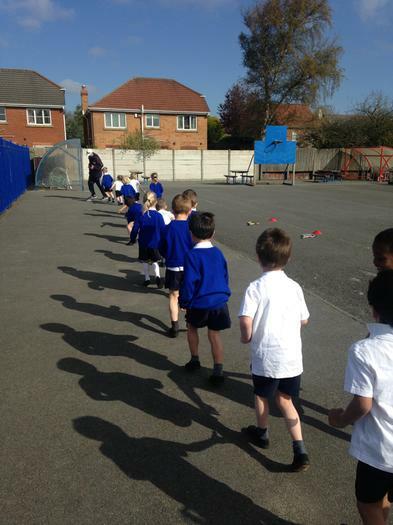 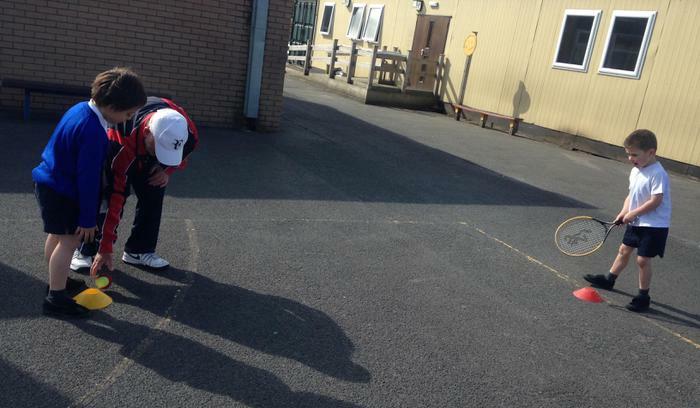 Sometimes it's linked to our topic, sometimes it's P.E. 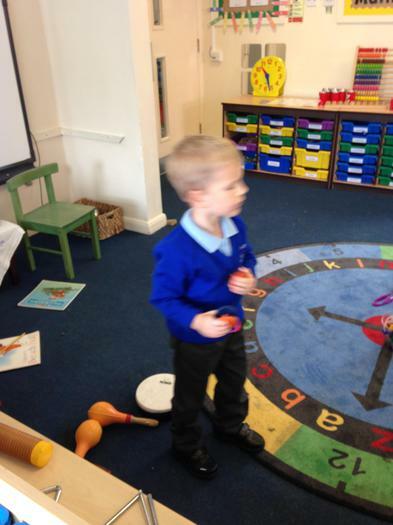 or Show and Tell or Personal, Social and Emotional Development (Circle Time Games). 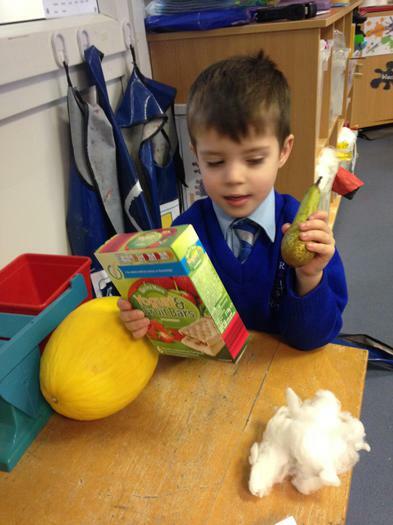 We have a piece of fruit each afternoon as part of the free fruit scheme Healthy Schools Government initiative. 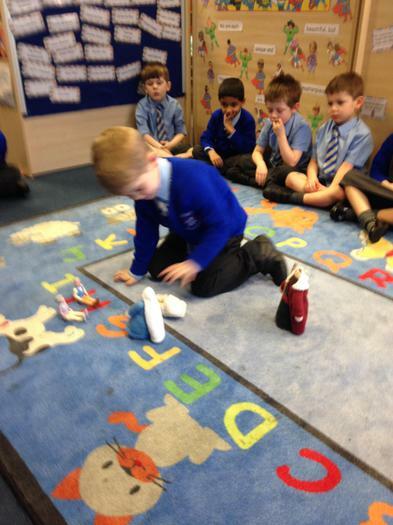 Each day we take part in Collective Worship and enjoy learning about Jesus through our Come and See topic. 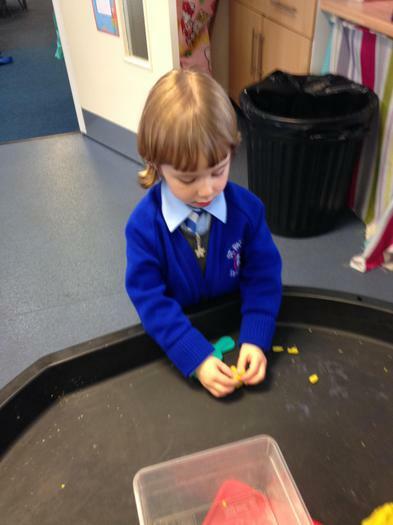 We say prayers in the morning, before and after lunch and before hometime. 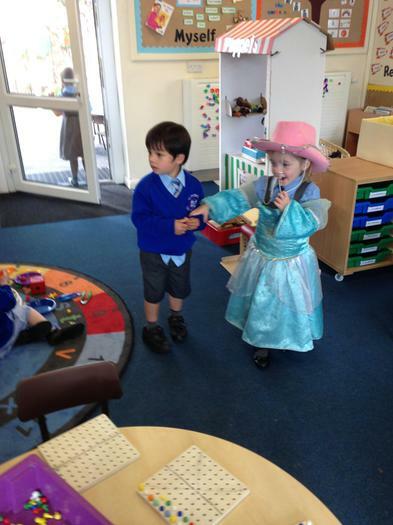 Before hometime, we like to finish our day with a story or song and then we are ready to go home at 3.30pm. 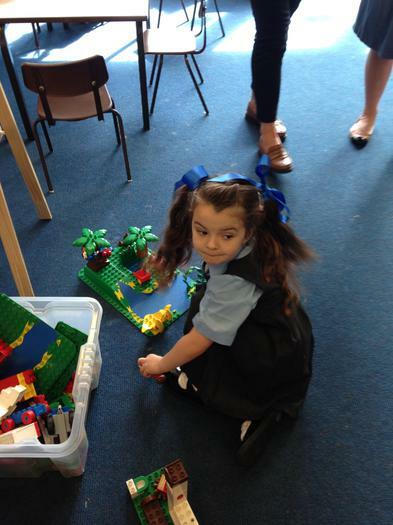 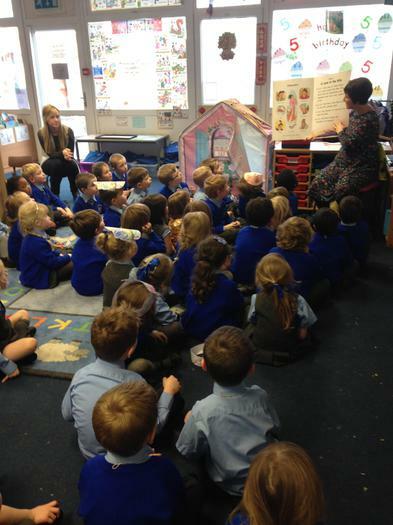 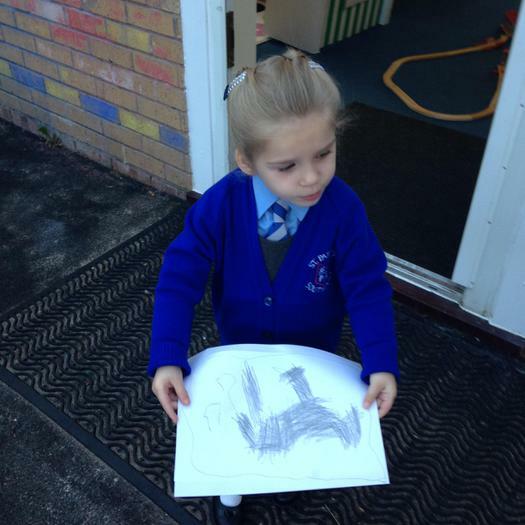 Our 1st Day in Reception. 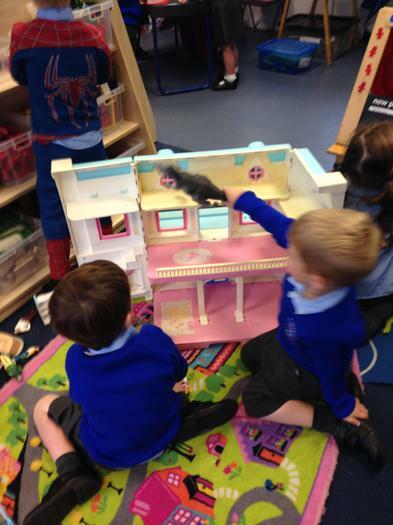 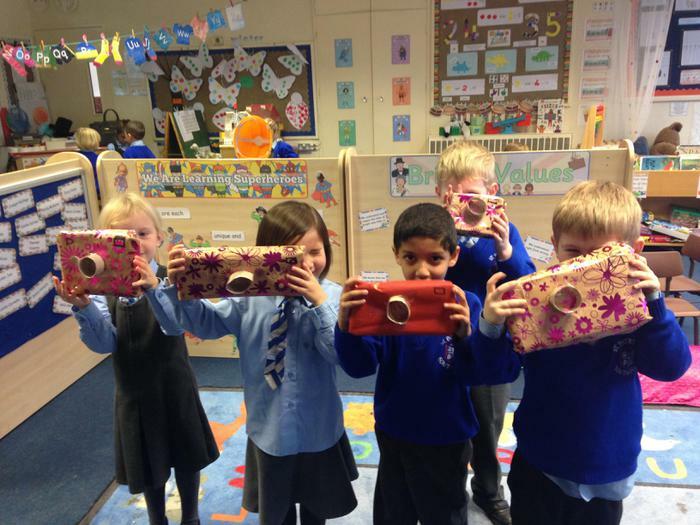 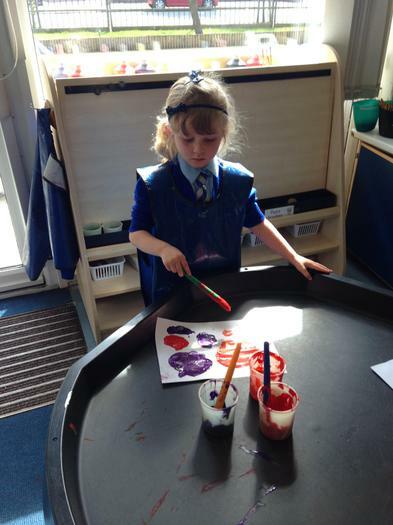 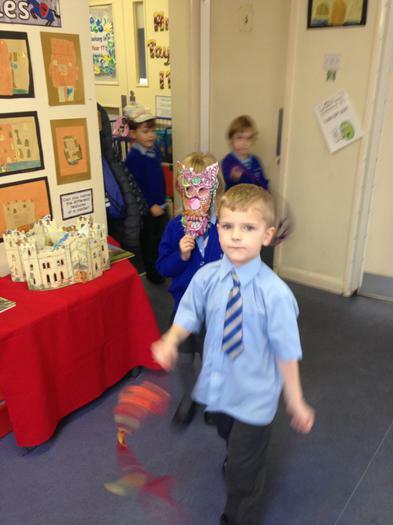 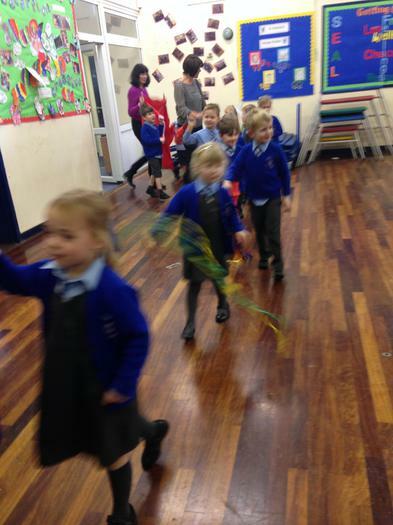 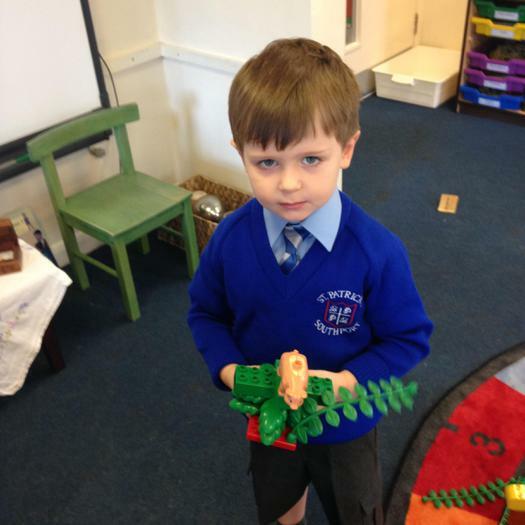 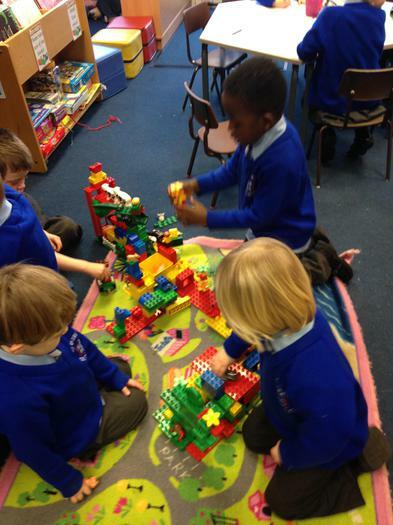 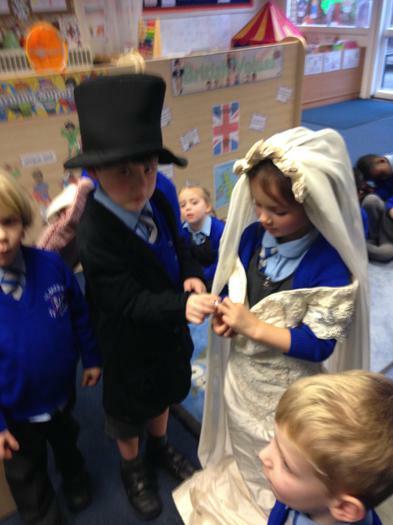 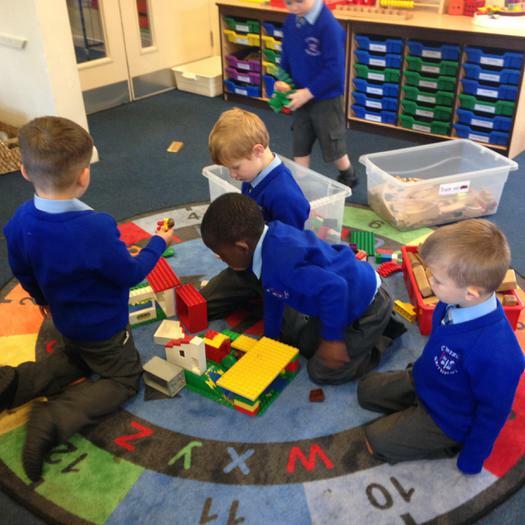 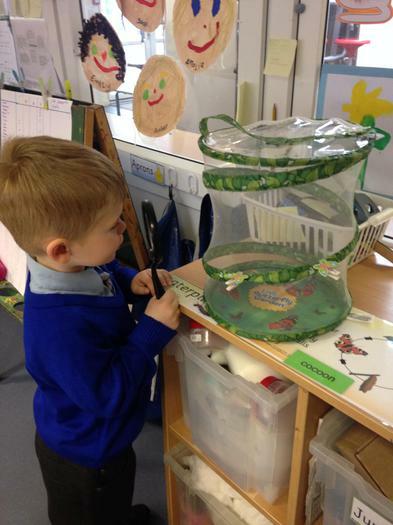 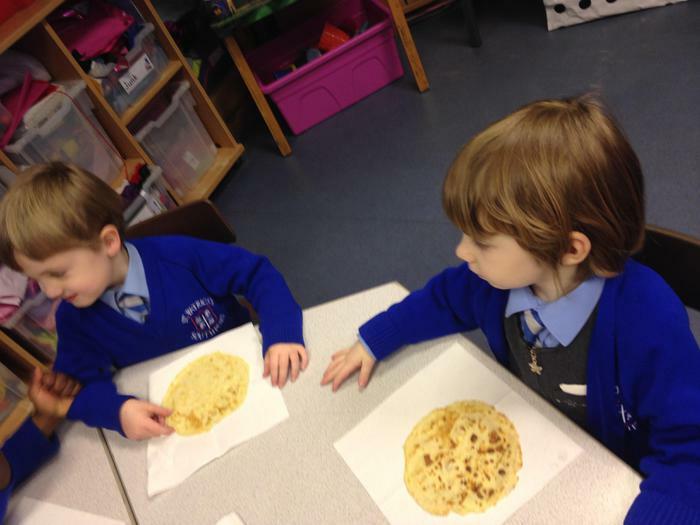 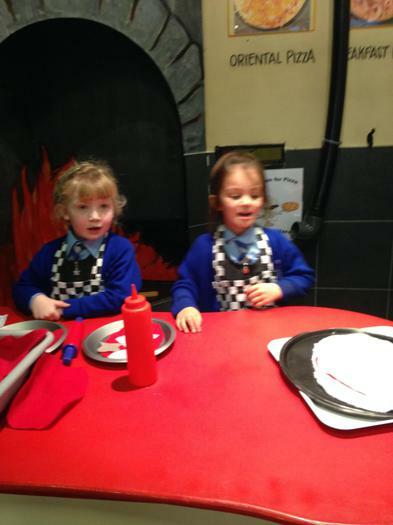 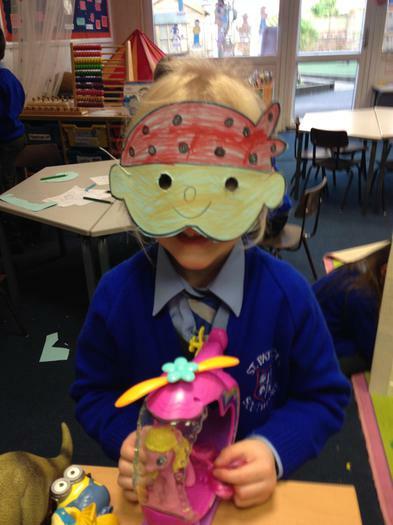 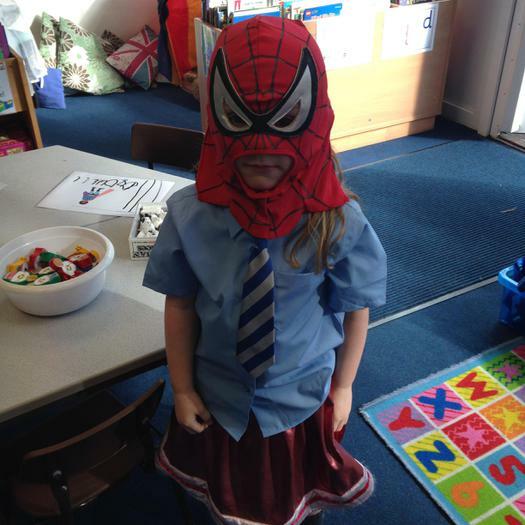 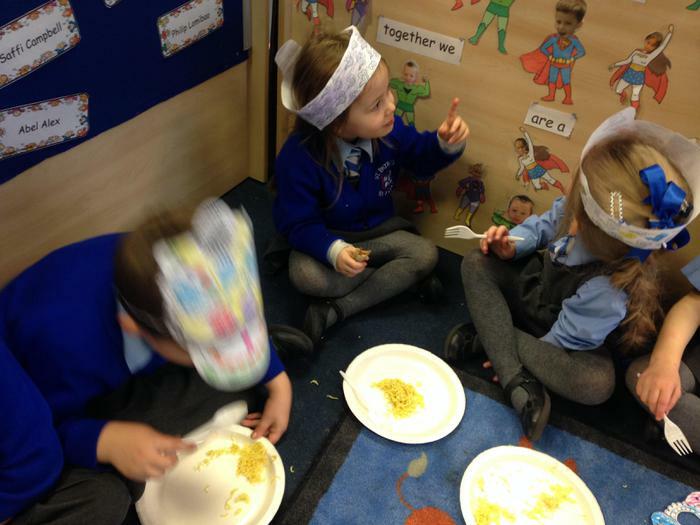 We have been having lots of fun in Reception. 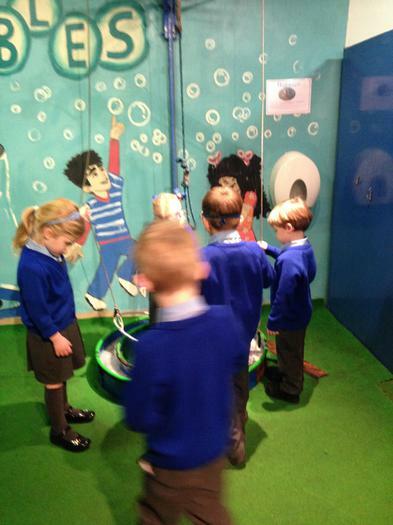 Our Trip to Underwater Street. 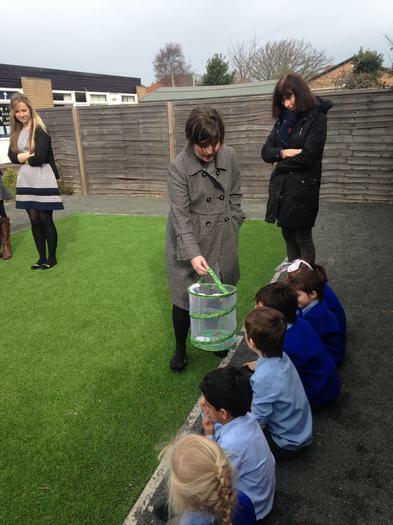 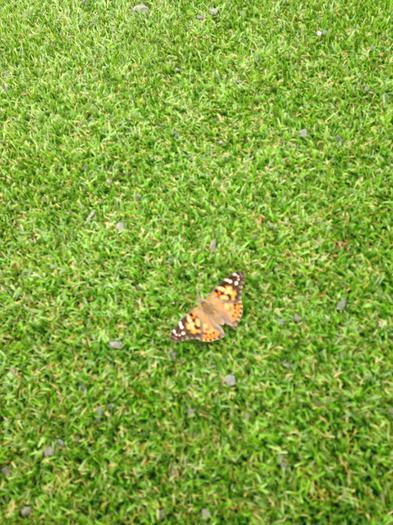 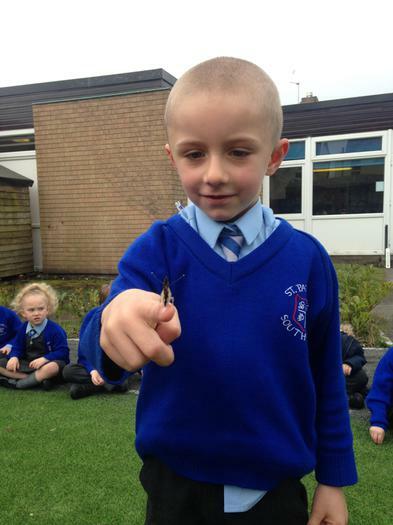 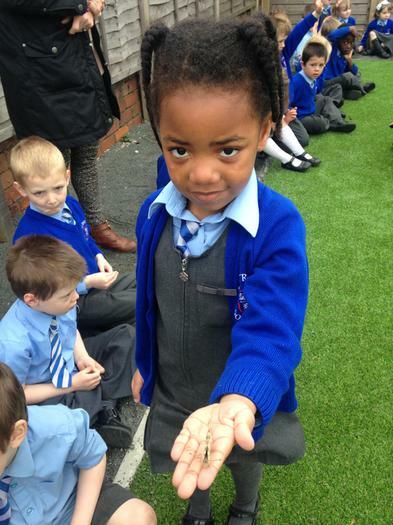 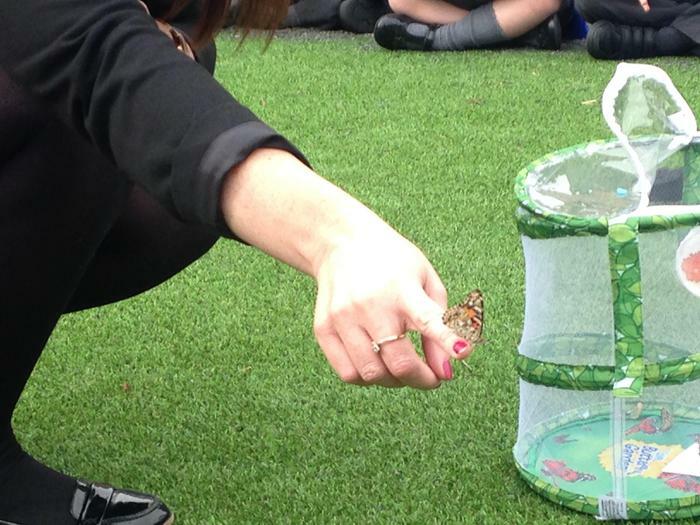 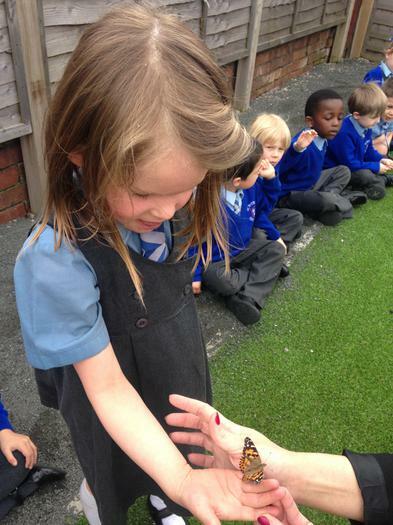 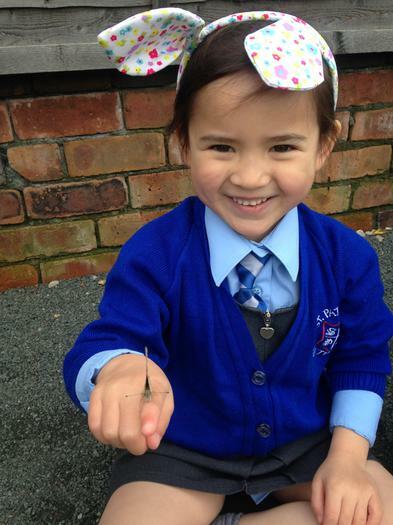 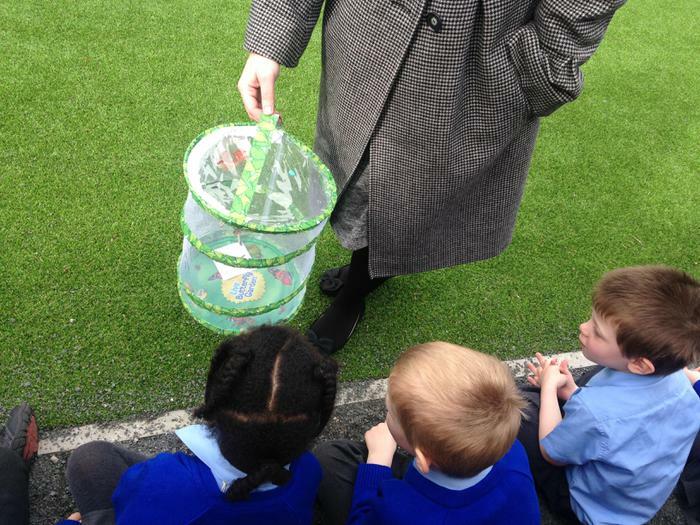 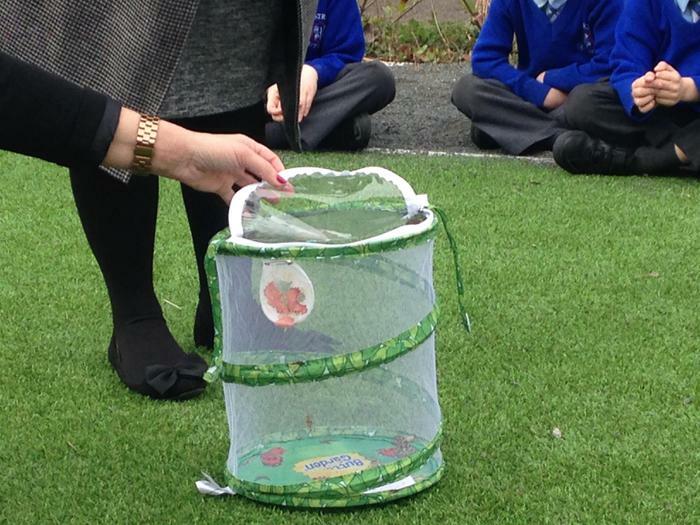 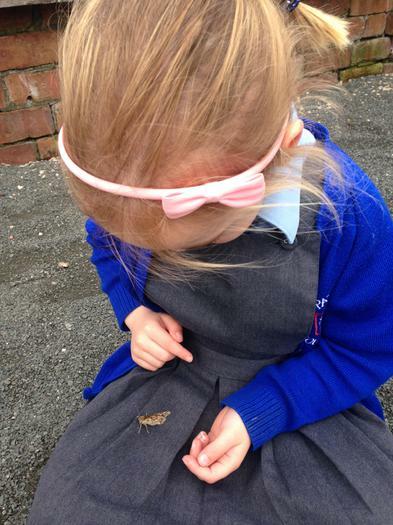 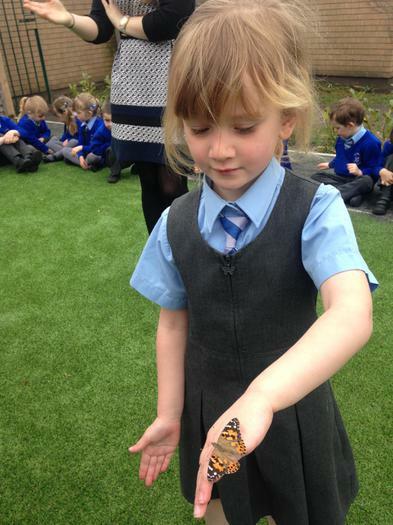 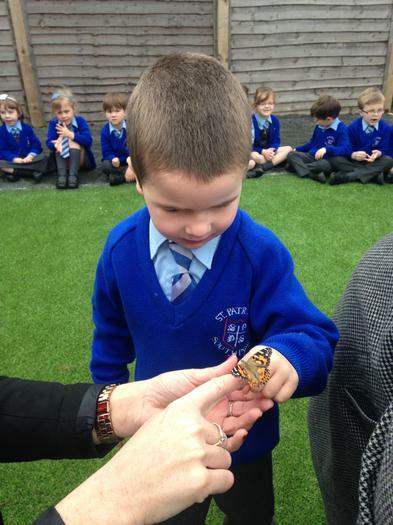 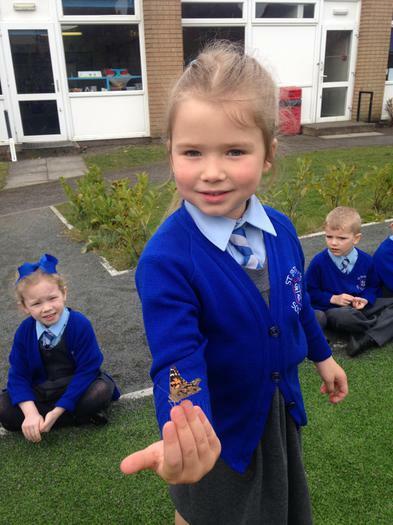 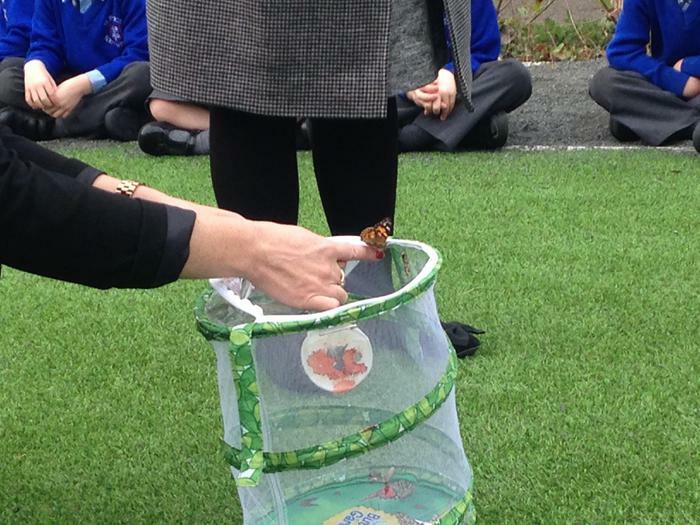 Releasing Mrs Shirley's class butterflies. 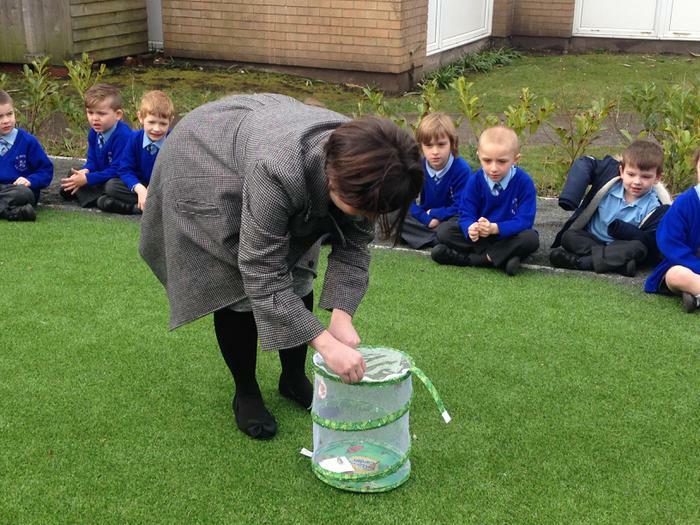 Ours are still in their cocoons!! 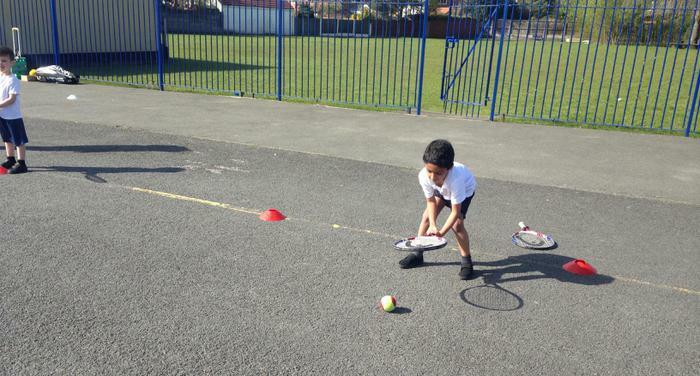 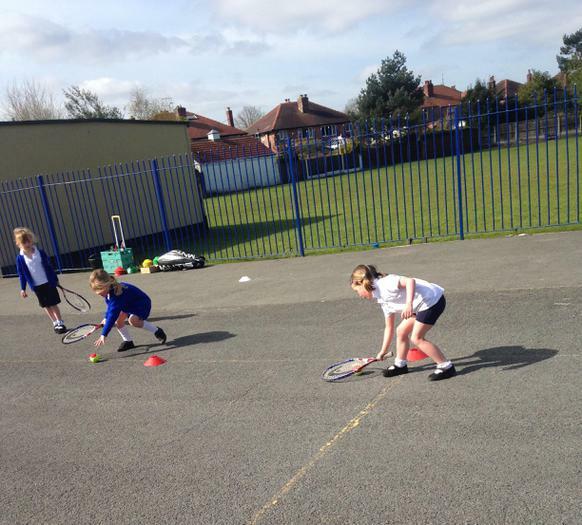 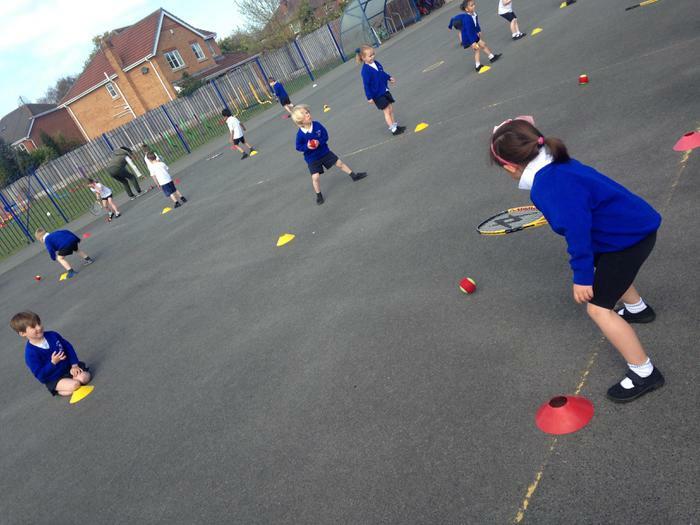 Learning How To Play Tennis!! 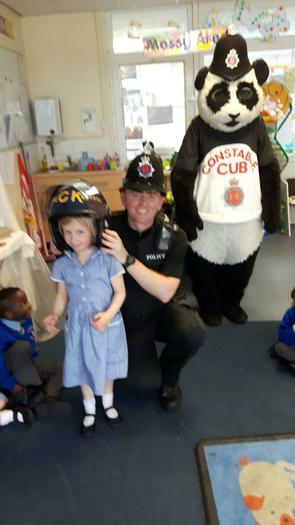 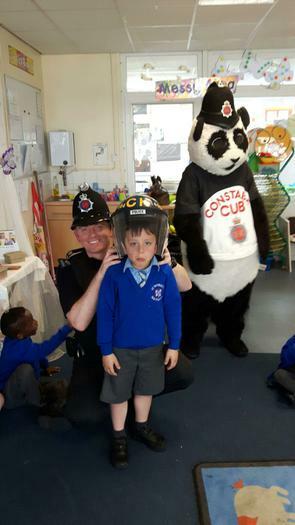 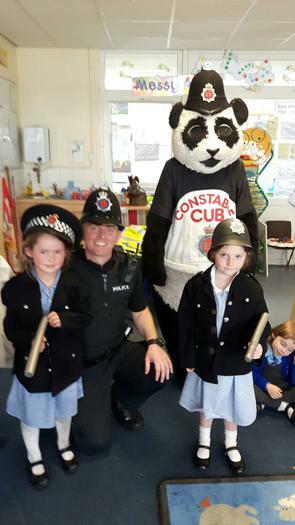 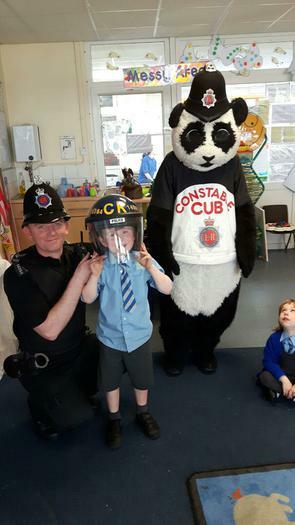 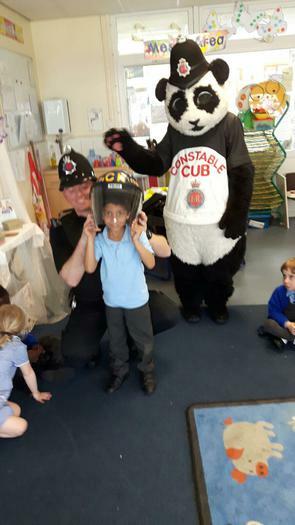 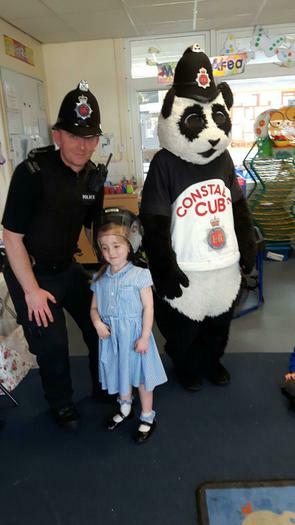 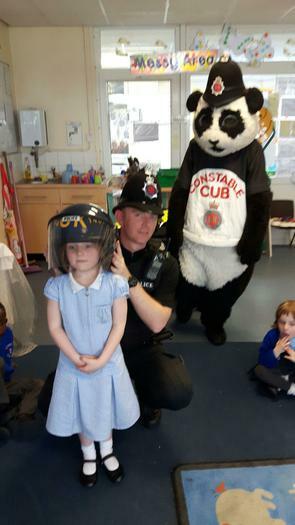 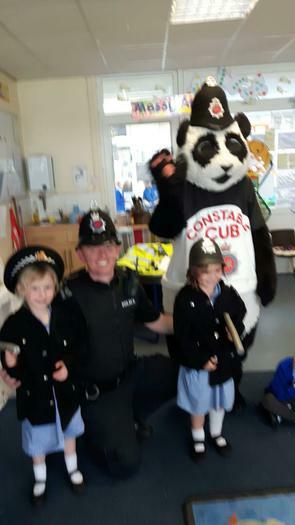 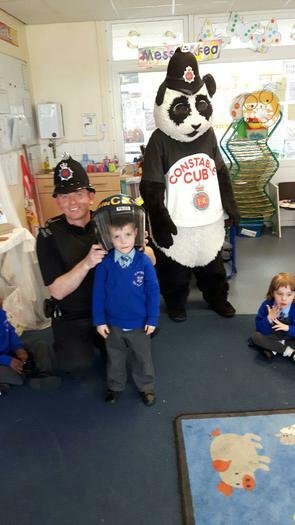 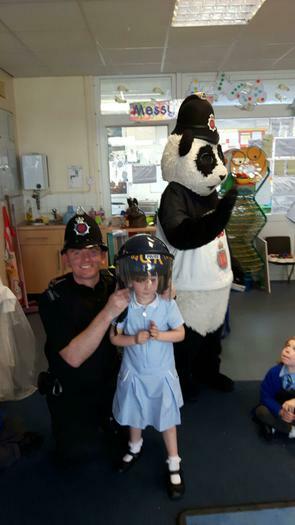 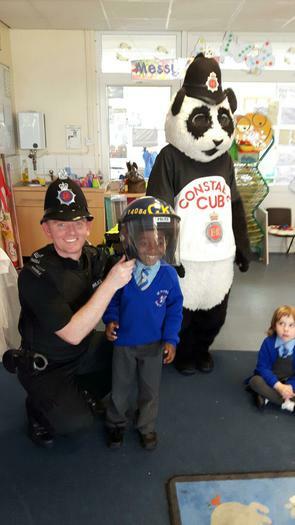 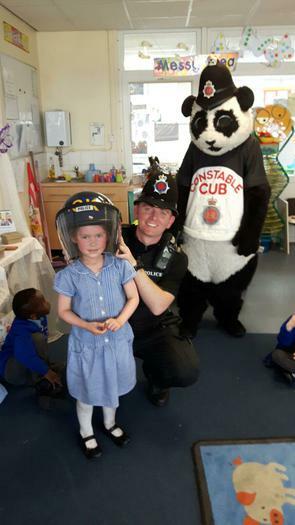 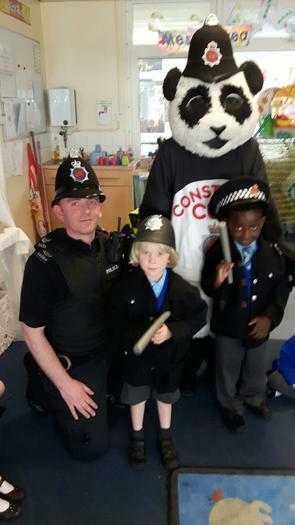 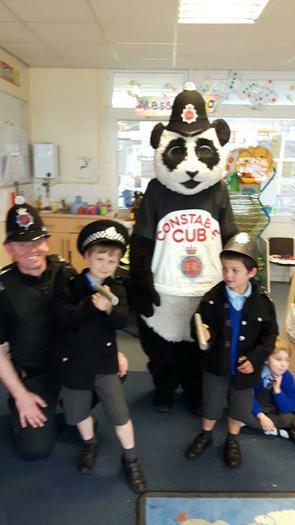 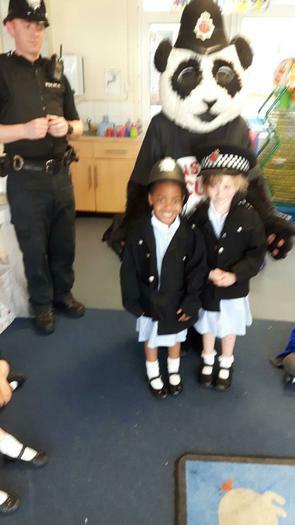 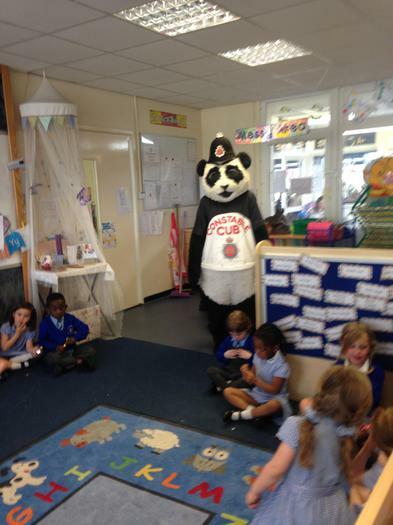 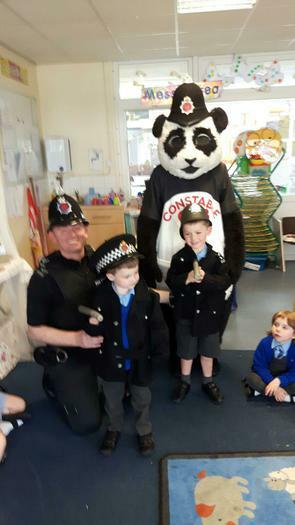 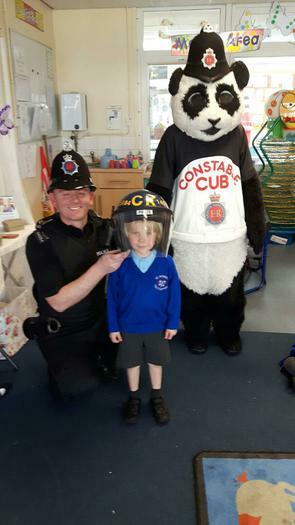 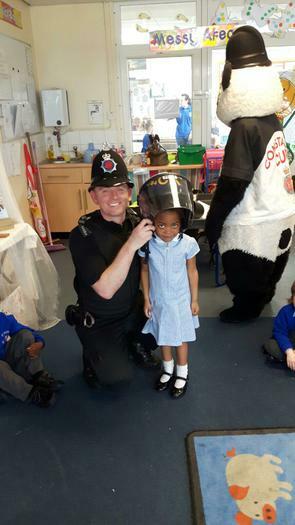 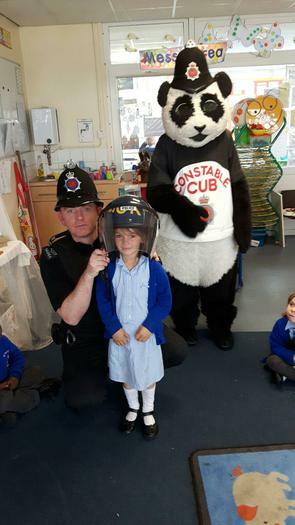 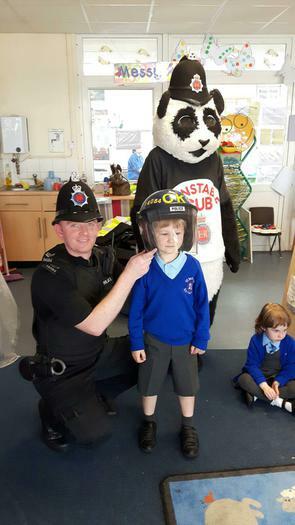 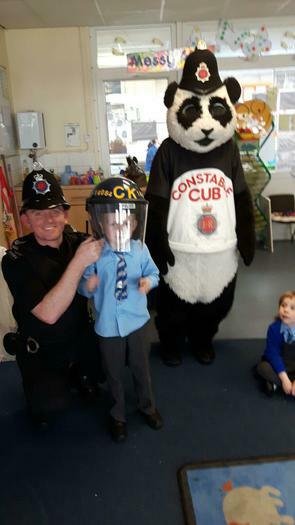 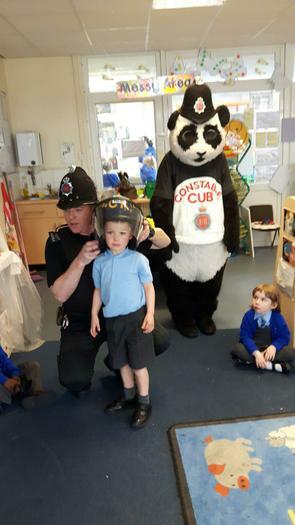 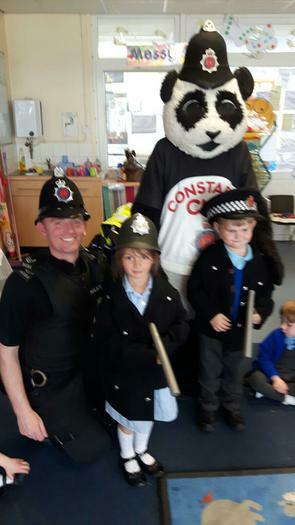 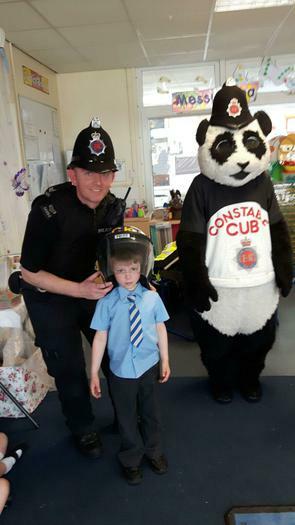 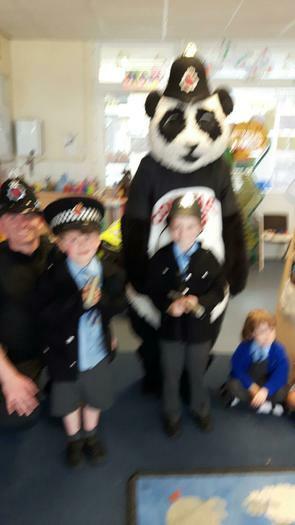 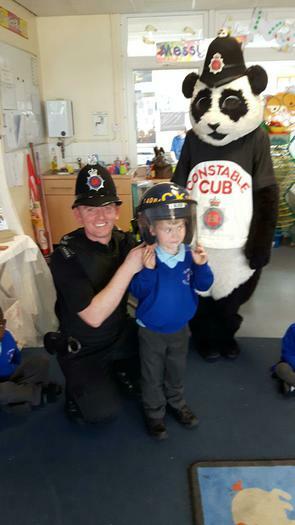 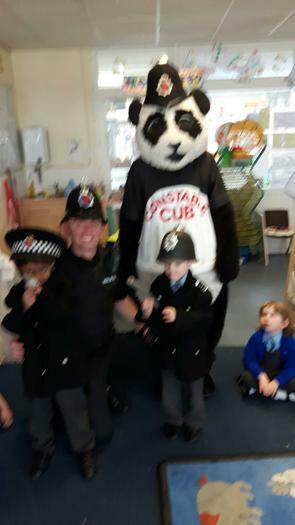 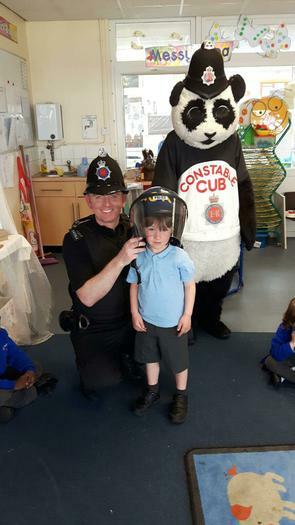 Our class visit from PC Panda to talk to us about Stranger Danger. 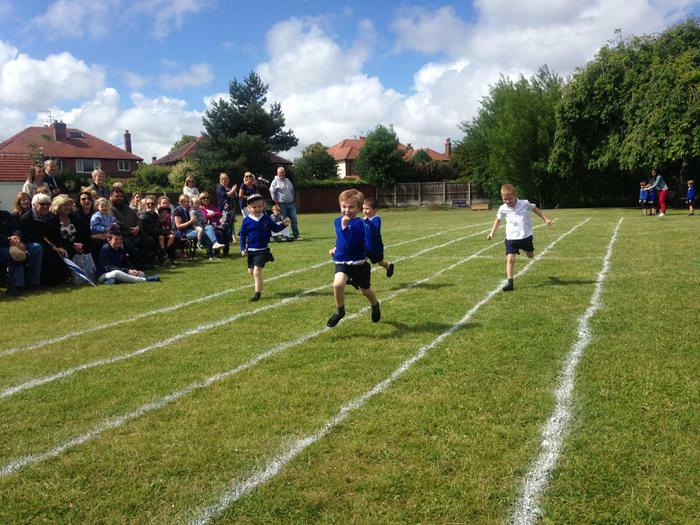 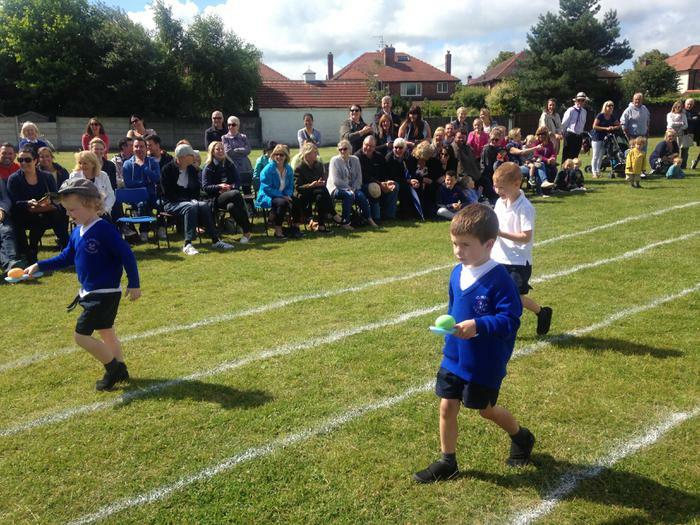 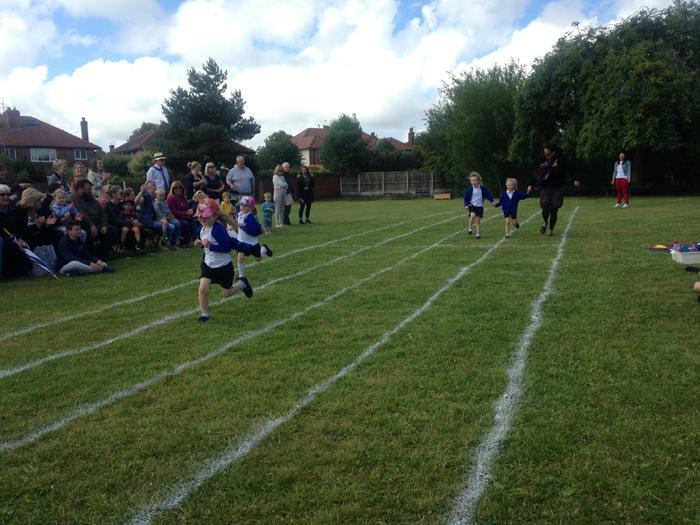 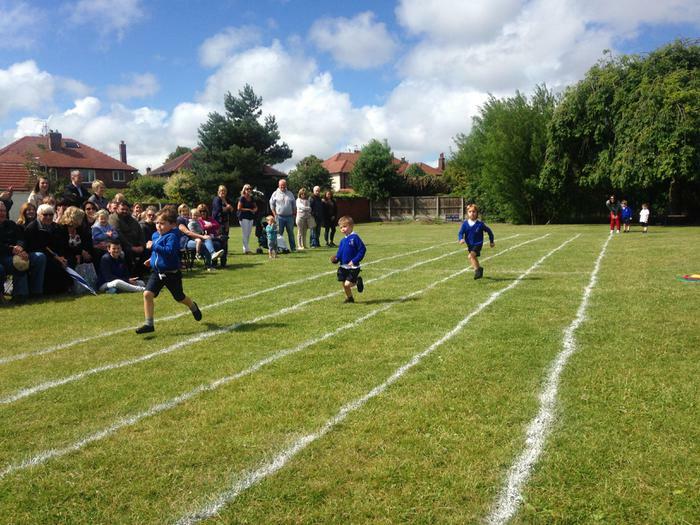 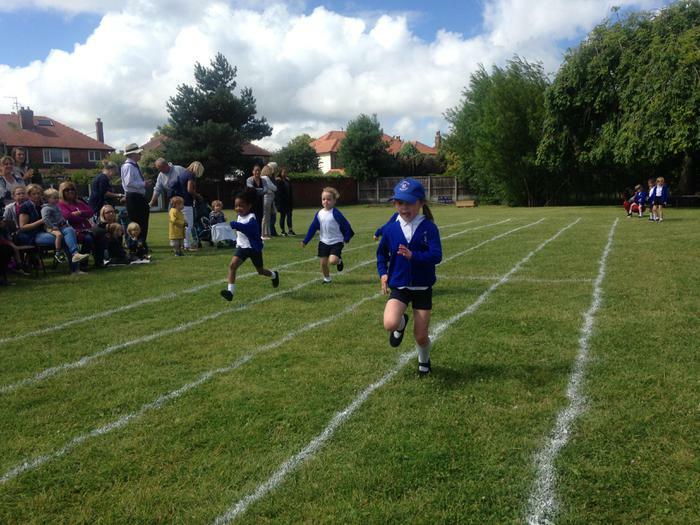 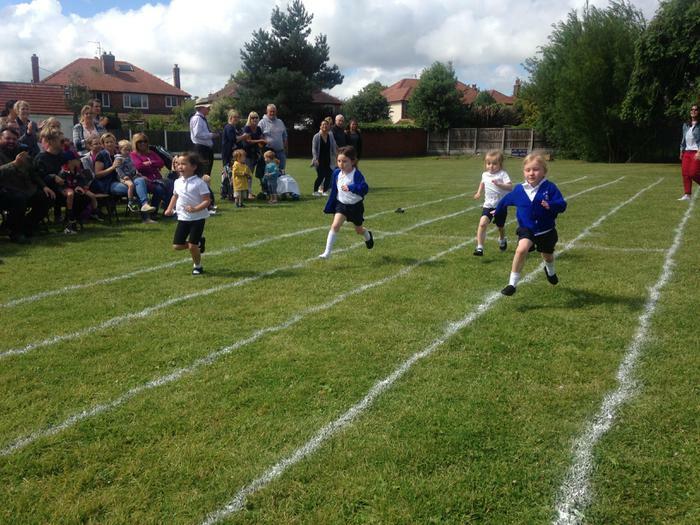 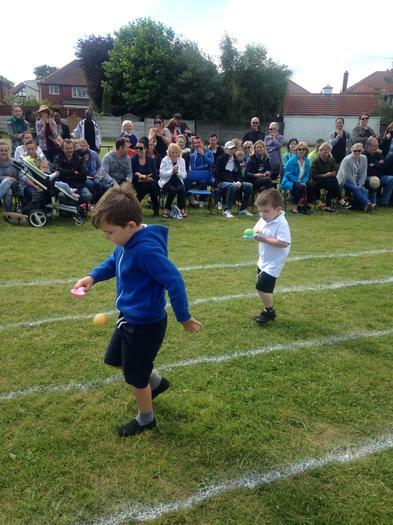 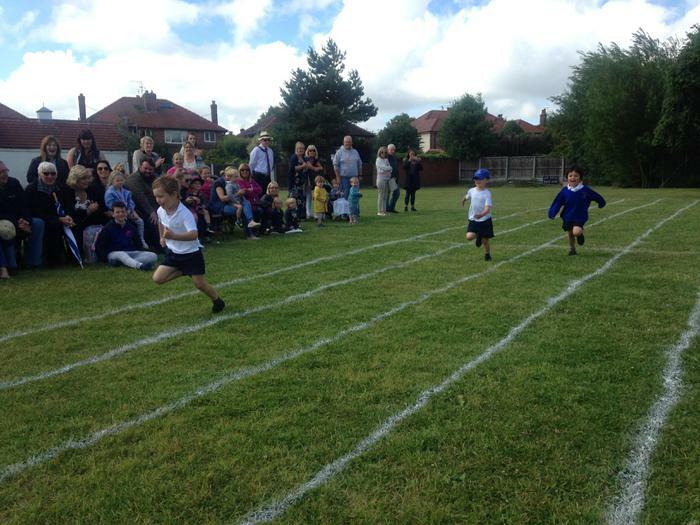 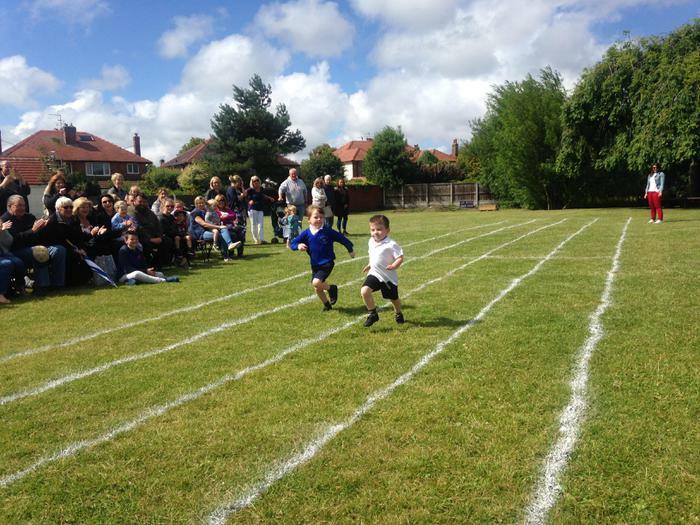 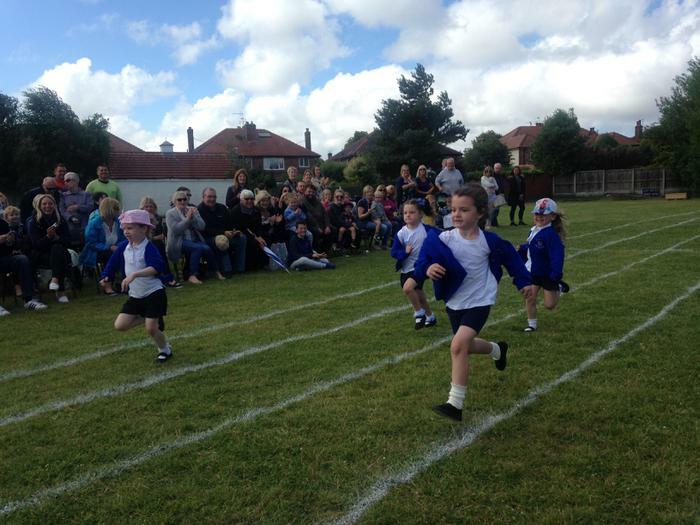 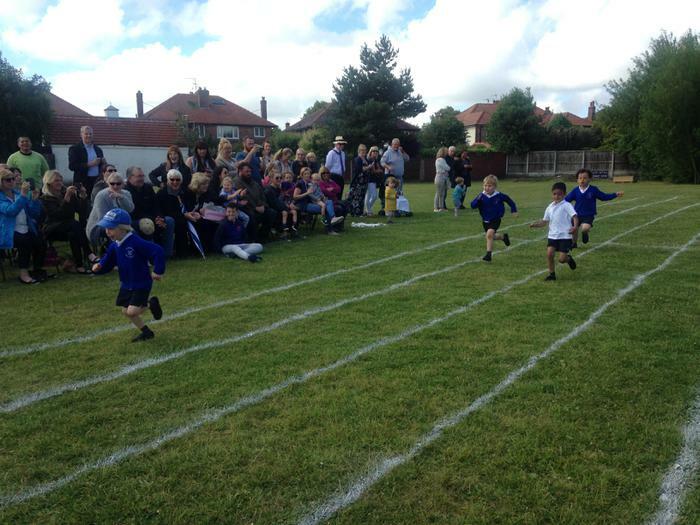 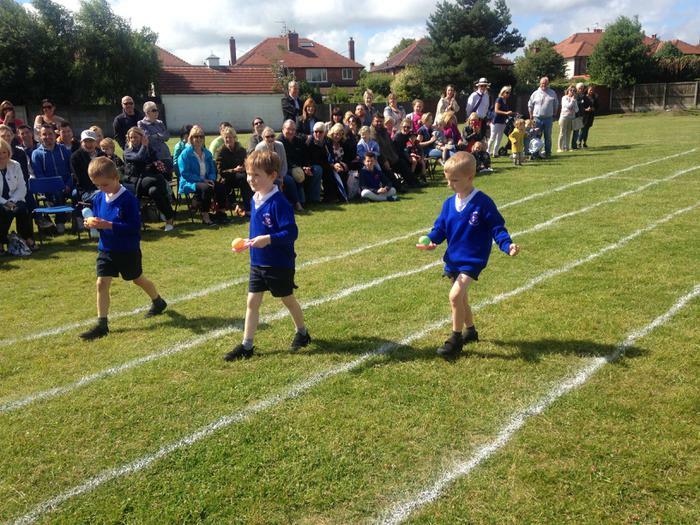 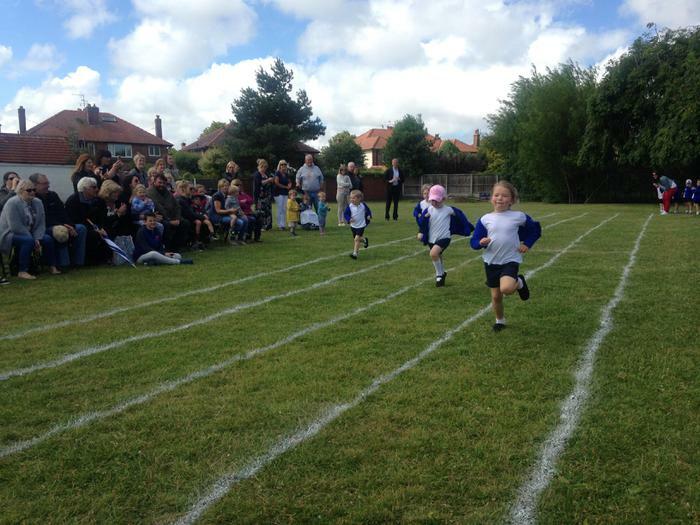 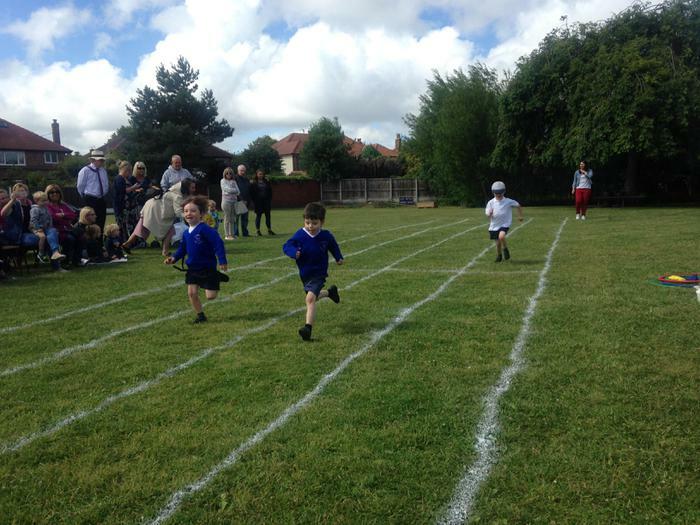 Sports Day was so much fun!